, oxides of the alkaline-earth metals, especially of calcium, strontium, and barium. They are not readily soluble in water and form solutions less basic than those of alkalies. in chemistry, oxides of the rare-earth metals. They were once thought to be elements themselves. They are widely distributed in the earth's crust and are fairly abundant, although they were once thought to be very scarce. Al2O3, chemical compound with m.p. about 2,000°C; and sp. gr. about 4.0. It is insoluble in water and organic liquids and very slightly soluble in strong acids and alkalies. Alumina occurs in two crystalline forms. ..... Click the link for more information. . A. L. Lavoisier was first to suspect that they might be compounds of more basic elements. Earth was one of the four "roots" of the Greek philosopher Empedocles, the other three being air, water, and fire. These substances were first called elements (stoicheia) by Plato. in geology and astronomy, 3rd planet of the solar system and the 5th largest, the only planet definitely known to support life. Gravitational forces have molded the earth, like all celestial bodies, into a spherical shape. However, the earth is not an exact sphere, being slightly flattened at the poles and bulging at the equator. The equatorial diameter is c.7,926 mi (12,760 km) and the polar diameter 7,900 mi (12,720 km); the circumference at the equator is c.24,830 mi (40,000 km). The surface of the earth is divided into dry land and oceans, the dry land occupying c.57.5 million sq mi (148.9 million sq km), and the oceans c.139.5 million sq mi (361.3 million sq km). The earth is surrounded by an envelope of gases called the atmosphere, of which the greater part is nitrogen and oxygen. , scientific study of earthquakes and related phenomena, including the propagation of waves and shocks on or within the earth by natural or artificially generated seismic signals. ..... Click the link for more information. ), by analogy with the composition of meteorites, and by consideration of the earth's size, shape, and density. Research by these methods indicates that the earth has a zoned interior, consisting of concentric shells differing from one another by size, chemical makeup, and density. The earth is undoubtedly much denser near the center than it is at the surface, because the average density of rocks near the surface is c.2.8 g/cc, while the average density of the entire earth is c.5.5 g/cc. ..... Click the link for more information. and ocean basins at the surface. The continents are composed of rock types collectively called sial, a classification based on their densities and composition. Beneath the ocean basins and the sial of continents lie denser rock types called sima. The sial and sima together form the crust, beneath which lies a shell called the mantle. The boundary between the crust and the mantle is marked by a sharp alteration in the velocity of earthquake waves passing through that region. This boundary layer is called the Mohorovičić discontinuity, or Moho. ..... Click the link for more information. ). The lower mantle, between c.410 and 1,800 mi (660 to 2,900 km), consists largely (70%) of high-density magnesium iron silicate called bridgmanite, believed to be the most abundant mineral on earth. Thought to be composed mainly of iron and nickel, the dense (c.11.0 g/cc) core of the earth lies below the mantle. The abrupt disappearance of direct compressional earthquake waves, which cannot travel through liquids, at depths below c.1,800 mi (2,900 km) indicates that the outer 1,380 mi (2,200 km) of the core are molten. The inner 780 mi (1,260 km) of the core are solid, and the innermost 190 mi (300 km) of that may be almost pure iron; the crystals of the innermost portion appear to be aligned along the plane of the equator, but those of the rest of the inner core appear to be aligned along the plane of the axis. The outer core is thought to be the source of the earth's magnetic field: In the "dynamo theory" advanced by W. M. Elasser and E. Bullard, tidal energy or heat is converted to mechanical energy in the form of currents in the liquid core; this mechanical energy is then converted to electromagnetic energy, which we see as the magnetic field. The magnetic field undergoes periodic reversals of its polarity on a timescale that ranges from a few thousand years to 35 million years. The last reversal occurred some 780,000 years ago. Of the planets, only Mercury and Venus are nearer to the sun; the mean distance from the earth to the sun is c.93 million mi (150 million km). The earth rotates from west to east about a line (its axis) that is perpendicular to the plane of the equator and passes through the center of the earth, terminating at the north and south geographical poles. The period of one complete rotation is a day; the rotation of the earth is responsible for the alternate periods of light and darkness (day and night). The earth revolves about the sun once in a period of a little more than 365 1-4 days (a year). The path of this revolution, the earth's orbit, is an ellipse rather than a circle, and the earth is consequently nearer to the sun in January than it is in July; the difference between its maximum and minimum distances from the sun is c.3 million mi (4.8 million km). This difference is not great enough to affect climate on the earth. ..... Click the link for more information. ) when all parts of the earth have equal day and night. When the northern end of the earth's axis is tilted away from the sun, the least direct sunlight falls on the Northern Hemisphere. This causes its winter season. The earth is estimated to be about 4.54 billion years old, based on radioactive dating of lunar rocks and meteorites, which are thought to have formed at the same time. The origin of the earth continues to be controversial. Among the theories as to its origin, the most prominent are gravitational condensation hypotheses, which suggest that the entire solar system was formed at one time in a single series of processes resulting in the accumulation of diffuse interstellar gases and dust into a solar system of discrete bodies. The generally accepted theory of the moon's formation hypothesizes that the early earth was impacted by a Mars-sized object, and that the collision ejected material that later formed the moon. Older and now generally discredited theories of the earth's formation invoked extraordinary events, such as the gravitational disruption of a star passing close to the sun or the explosion of a companion star to the sun. See R. F. Flint, The Earth and Its History (1973); H. Jeffreys, The Earth (6th ed. 1976); F. Delobeau, The Environment of the Earth (1976); W. R. Brown and N. D. Anderson, Earth Science (rev. ed. 1977); D. Attenborough, The Living Planet (1985); R. Fortey, Earth (2004). The third planet of the Solar System and the only one known to possess life. It is the largest of the inner planets (equatorial radius: 6378 km) and has one natural satellite, the Moon. A summary of the Earth's orbital and physical characteristics are given in Table 1, backmatter. The Earth has a substantial atmosphere, mainly of nitrogen and oxygen, and a magnetosphere linked to a magnetic field. (See atmosphere, composition; atmospheric layers; geomagnetism; Van Allen radiation belts.) Two-thirds of the planet is covered by water, ocean depth ranging from 2500 to 6500 meters; the average land elevation is 860 meters. See also geoid. On average the Earth's surface transfers to the atmosphere an amount of energy equal to that it absorbs. The Earth's mean surface temperature, i.e. that needed to keep Earth and atmosphere in thermal equilibrium, is 13 °C. Temperatures in the atmosphere generally decrease from equator to poles and from low to high atmospheric altitudes. These temperature gradients, together with the Earth's rapid rotation, drive the circulation of the atmosphere. On average the Earth emits into space an amount of radiant energy equal to that absorbed by surface plus atmosphere. The Earth's effective temperature, i.e. that needed to keep Earth in thermal equilibrium with space, is –18 °C; this is the Earth's temperature as measured from space. Studies of the refraction and reflection of seismic waves propagating through the Earth show that it consists of three main internal layers: the crust, mantle, and core. The crust has a thickness of about 30–40 km under the continents (but much thicker beneath mountains) and an average of 6 km under the oceans. It has a density of about 3 times that of water. It consists largely of sedimentary rocks, such as limestone and sandstone, resting on a base of igneous rocks, such as granite (under the continents) and basalt (under both the continents and oceans). The mantle extends to a depth of 2900 km, its density increasing with depth from 3.3 to 5.5 times that of water. Its composition is thought to include a high proportion of magnesium- and iron-rich silicate rocks. The core increases in density from 10 times that of water at its junction with the mantle to 13 times at the center. It is composed predominently of iron with several, possibly many, additional components. The inner core has a radius of about 1200 km and is solid. The outer core has a radius of 3485 km; it is liquid and is regarded as the seat of the Earth's magnetic field (see geomagnetism). It is believed that the pressure at the Earth's center may reach 400 gigapascals (4 million atmospheres), while the internal temperature rises with increasing depth and may exceed 4000 °C at the center. The heat required to maintain these temperatures is derived from the natural radioactivity of the Earth's constituent rocks, but would have been greatly augmented soon after formation by gravitational compression and the impact of meteoritic material. This led to the widespread melting and differentiation that produced the present layered structure. After 4.6 thousand million years the Earth's internal heat is still a source of mechanical power, producing earthquakes and volcanic eruptions, raising mountains, and moving continent-sized blocks about its surface. It is regarded as a convective heat engine. The crust and part of the upper mantle form a rigid zone, 50–70 km thick, known as the lithosphere. This lies above the weaker less rigid asthenosphere. According to the theory of plate tectonics, the lithosphere is broken up into fairly rigid plates; there are seven major plates and many smaller ones. Convection within the asthenosphere causes the plates, with their associated continental and/or oceanic crust, to move relative to each other: the phenomena of continental drift and sea-floor spreading. The relative motion amounts to a few cm per year. The plate boundaries are defined by a global map of earthquake epicenters. At transform boundaries between two plates the plates can slide past each other. At constructive boundaries two plates are moving apart. Where this occurs in mid-ocean, molten rock from the mantle is injected into the crust to form mid-oceanic ridges. At destructive boundaries two plates are moving toward each other. The oceanic part of one plate can plunge under another plate in a process called subduction, forming an island arc or mountain range. The four elements—Earth, Air, Fire and Water—are associated in the magic circle with the four directions of North, East, South, and West. Earth is connected with the Goddess, the Mother. It is fertile and nurturing, stabilizing and grounding. Many traditions of Wicca apply Earth to the North and further associate it with the colors green or brown and with the elementals known as gnomes. Earth is related to reliability, solidity, law, and the order of things. In Ritual or Ceremonial Magic, Earth is also associated with Auriel and with the night, winter, the Tarot suit of Pentacles, and the Hebrew letter Heh. The elements of Earth, Air, Fire, and Water are differently assigned to the directions in the Native American Medicine Wheels; those associations vary from tribe to tribe. the third planet from the sun in the solar system, with the astronomical sign ⊕ or ♂. The earth is fifth in size and mass among the large planets, but it is the largest planet of the so-called terrestrial planets, which include Mercury, Venus, the earth, and Mars. The most important feature distinguishing the earth from the other planets of the solar system is the existence on it of life, which has reached its highest and most intelligent form in man. Conditions for the development of life on the bodies of the solar system closest to the earth are unfavorable; and inhabited bodies outside the solar system have not yet been discovered. But life is a natural phase in the development of matter, and therefore the earth cannot be considered the only inhabited cosmic body in the universe; nor can earthly life forms be considered the only possible forms. According to current cosmogonic ideas the earth was formed 4.5 billion years ago by gravitational condensation from gas-dust matter that was scattered in the space around the sun and contained all the chemical elements known in nature. The formation of the earth was accompanied by the differentiation of this matter. The differentiation was promoted by the gradual warming-up of the earth’s interior, which occurred mainly because of heat lost during the decay of radioactive elements (such as uranium, thorium, and potassium). The result of this differentiation was the division of the earth into concentrically arranged layers—geospheres that differ in chemical composition, aggregate state, and physical properties. In the center the core of the earth formed, surrounded by the mantle. The earth’s crust, which is located on top of the mantle, arose from the lightest and most easily fusible components of matter that were discharged from the mantle during melting processes. The aggregate of these internal geospheres bounded by the solid surface of the earth is sometimes called the “solid” earth. (Although this is not completely precise because it has been determined that the outer part of the core has the properties of a viscous liquid.) The “solid” earth includes almost the entire mass of the planet (see Table 1). Outside it are the external geospheres—water (the hydrosphere) and air (the atmosphere), which formed from the vapors and gases that were discharged from the earth’s interior during the degassing of the mantle. The differentiation of the matter in the earth’s mantle and replenishment of the earth’s crust and the water and air shells with products of differentiation has occurred throughout all geologic history and continues today. The largest part of the earth’s surface is occupied by the world ocean (361.1 million sq km, or 70.8 percent); land constitutes 149.1 million sq km (29.2 percent) and forms six large masses—the continents Eurasia, Africa, North America, South America, Antarctica, and Australia (see Table 2). The land portion also includes numerous islands. The division of land into continents does not coincide with the division of the world into parts; Eurasia is divided into two parts of the world, Europe and Asia, while both American continents are considered one part of the world, America. Sometimes the islands of the Pacific Ocean are taken to be a special “oceanic” part of the world, Oceania, whose area is usually considered together with Australia. The world ocean is divided by the continents into the Pacific, Atlantic, Indian, and Arctic oceans (see Table 3); some scholars view the Antarctic parts of the Atlantic, Pacific, and Indian oceans as a separate Southern Ocean. The northern hemisphere of the earth is the continental hemisphere (land occupies 39 percent of its surface), while the southern hemisphere is oceanic (land constitutes just 19 percent of its surface). In the western hemisphere water occupies the largest part of the surface, while in the eastern hemisphere land does. The generalized profile of the land area and floor of the oceans forms two gigantic “steps,” the continental and the oceanic. The continental “step” rises above the oceanic by an average of 4,670 m. (The average elevation of the land is 875 m, and the average depth of the ocean is about 3,800 m.) Above the level surface of the continental “step” rise mountains; some of their peaks have elevations of 7–8 km and more. The highest peak in the world is Mount Chomolungma (Everest) in the Himalayas, which reaches 8,848 m. It is almost 20 km above the deepest spot on the ocean floor (the Marianas Trench in the Pacific Ocean, about 11,022 m deep). The earth has gravitational, magnetic, and electric fields. The earth’s gravitational attraction holds the moon and artificial satellites in earth orbits. The action of the gravitational field causes the earth’s spherical shape, many features of the relief of the earth’s surface, the flow of rivers, the movement of glaciers, and other processes. 1 Reading from the top of the column down, the mountain peaks are Chomolungma (Everest), Kilimanjaro, McKinley, Aconcagua, Vinson Massif, and Kosciusko. The highest peak in Oceania is Mount Jaja (5,029 m) on the island of New Guinea. space it occupies an area whose volume is much greater than the earth’s volume, while the shape resembles a comet with a tail directed away from the sun. This area is called the magnetosphere. The earth’s electric field is closely tied to its magnetic field. The “solid” earth carries a negative electric charge which is compensated for by the positive space charge of the atmosphere, so that as a whole the earth appears to be electrically neutral. In the space bounded by the outer limit of the earth’s geophysical fields (primarily in the magnetosphere and atmosphere), there is successive and profound alteration in primary space factors—the absorption and transformation of solar and galactic cosmic rays, solar wind, and X-ray, ultraviolet, optical, and radio-frequency radiation from the sun; this is very important for processes taking place on the earth’s surface. By holding back the greater part of hard electromagnetic and corpuscular radiation, the magneto-sphere and, especially, the atmosphere protect living organisms against their lethal action. The earth receives 1.7 x 1017 joules per sec (or 5.4 x 1024 joules per year) of radiant solar energy, but only about 50 percent of this amount reaches the surface of the earth, where it serves as the main source of energy for most of the processes taking place there. The earth’s surface and the hydrosphere, as well as the adjacent layers of the atmosphere and the earth’s crust, are jointly called the geographic, or landscape, shell. The geographic shell was the arena for the appearance of life, whose development was promoted by the presence on the earth of certain physical and chemical conditions necessary for the synthesis of complex organic molecules. Direct or indirect participation by living organisms in many geochemical processes has, with time, assumed global scope and qualitatively changed the geographic shell, transforming the chemical composition of the atmosphere, the hydrosphere, and (partially) the earth’s crust. Human activity also has a global effect on the course of natural processes. In view of the enormous significance of living matter as a geological agent, the entire sphere where life and biogenic products are found was named the biosphere. the shape of a lotus. Many other peoples thought that the earth was a flat disk surrounded by water. About 3,000 years ago, however, correct ideas also began to appear. The Chal-deans were the first to note, on the basis of observation of lunar eclipses, that the earth is spherical. Pythagoras, Parmenides (sixth and fifth centuries B.C. ), and Aristotle (fourth century B.C.) tried to provide scientific substantiation for this. Eratosthenes (third century B.C.) made the first attempt to determine the dimensions of the earth by the length of the meridian arc between the cities of Alexandria and Syene (Africa). Most of the ancient scientists thought that the earth was the center of the universe. This geocentric conception was worked out most fully by Ptolemy in the second century A .D. However, Aristarchus of Samos (fourth and third centuries B.C.) developed heliocentric theories significantly earlier, believing the sun to be the center of the universe. In the Middle Ages, ideas of the earth’s spherical shape and its movement were denied because they contradicted the Scriptures; such ideas were declared to be heresy. Only in the age of the Renaissance, with the beginning of the great geographic discoveries, did the idea that the earth was round again win recognition. In 1543, Copernicus proved scientifically that the universe was a heliocentric system, with the earth and the other planets revolving around the sun. But this theory had to withstand a prolonged, desperate struggle with the geocentric system, which the Christian church continued to support. Such tragic events as the burning of G. Bruno and Galileo’s forced renunciation of heliocentric theories were part of this struggle. Final confirmation of the heliocentric system came after J. Kepler discovered the laws of planetary motion at the start of the 17th century and I. Newton formulated the law of universal gravitation in 1687. The structure of the “solid” earth has been clarified mainly in the 20th century thanks to the achievements of seismology. The discovery of the radioactive decay of elements led to a basic revision of many fundamental conceptions. In particular, the idea that the earth had originally been in a liquidmolten state was replaced by ideas which held that it formed from accumulations of cold solid particles. Using radioactive decay, methods were developed to determine the absolute age of rocks; this permitted an objective estimate of the length of the earth’s history and the speed of the processes taking place on its surface and in the interior. The use of rockets and satellites in the second half of the 20th century has made it possible to formulate theories about the upper layers of the atmosphere and the magnetosphere. The earth is studied by many sciences. The figure and dimensions of the earth are investigated by geodesy, astronomy studies the earth’s motions as a celestial body, and the earth’s fields of force are studied by geophysics (partly also by astrophysics), which also investigates the physical state of the earth’s matter and the physical processes taking place in all geospheres. Geochemistry studies the laws governing the distribution of the earth’s chemical elements and the processes of the elements’ migration. The material composition of the lithosphere and the history of its development are studied by the geological sciences. Natural phenomena and processes taking place in the geographic shell and bio-sphere are the subject of the geographic and biological sciences. Sciences that study the laws of interaction between nature and society also concern themselves with earth problems. The earth is a large planet of the solar system, third in distance from the sun. The earth’s mass is equal to 5,976 x 1021 kg, which is 1/448 of the mass of the large planets and 1/330,000 of the mass of the sun. Under the influence of the sun’s gravitation the earth, like the other bodies of the solar system, revolves about the sun in an elliptical orbit (which is only slightly different from a circular orbit). The sun is located at one of the focuses of the earth’s elliptical orbit, and therefore the distance between the earth and the sun changes during the course of a year from 147,117 million km (at the perihelion) to 152,083 million km (at the aphelion). The semimajor axis of the earth’s orbit, which is 149.6 million km, is taken as the unit of measurement in measuring distances within the solar system. The velocity of the earth’s motion along its orbit, which averages 29.765 km per sec, varies between 30.27 km per sec (at the perihelion) and 29.27 km per sec (at the aphelion). Along with the sun the earth also moves around the center of the Milky Way Galaxy; the period of a galactic revolution is about 200 million years and the average velocity is 250 km per sec. Relative to the closest stars the sun and earth are moving at a velocity of ~ 19.5 km per sec in the direction of the constellation Hercules. The period of the earth’s revolution around the sun, called the year, varies slightly in length depending on which bodies or points on the celestial sphere we examine with respect to the motion of the earth and the related apparent motion of the sun in the sky. The period of revolution corresponding to the interval of time between two passages of the sun through the vernal equinox is called the tropical year. The tropical year is the basis of the calendar, and it is equal to 365.242 mean solar days. The plane of the earth’s orbit (plane of the ecliptic) in the present age is inclined at an angle of 1.6° to the socalled Laplacian invariable plane, which is perpendicular to the principal vector of the angular momentum of the entire solar system. Under the influence of the gravitation of the other planets the position of the plane of the ecliptic and also the shape of the earth’s orbit are slowly changing over the course of millions of years. The inclination of the ecliptic to the Laplacian plane is changing from 0° to 2.9°, while the eccentricity of the earth’s orbit is changing from 0 to 0.067. In the present age the eccentricity is 0.0167 and is decreasing by 4 x 10”7 per year. If we look at the earth from above the north pole its orbital motion is counterclockwise, that is, in the same direction as its rotation on its axis and the same direction as the revolution of the moon around the earth. The earth’s natural satellite, the moon, revolves around the earth in an elliptical orbit at a mean distance of 384,400 km (~ 60.3 of the mean radius of the earth). The mass of the moon is 1:81.5 of the mass of the earth (73.5 x 1021 kg). The center of mass of the earth-moon system is three-fourths of the earth’s radius away from the center of the earth. Both bodies, the earth and the moon, revolve around the center of mass of the system. The ratio of the moon’s mass to the earth’s mass is the largest among all the planets in the solar system and their satellites, and therefore the earth-moon system is often viewed as a double planet. The earth has a complex shape resulting from the combined action of gravitation, the centrifugal forces caused by the rotation of the earth on its axis, and the sum total of internal and external relief-forming forces. The level surface of gravitational potential (that is, the surface which is at all points perpendicular to the direction of plumb) that coincides with the surface of the water in the oceans (in the absence of waves, tides, currents, and disturbances caused by change in atmospheric pressure) is taken as the approximate shape (figure) of the earth. This surface is called the geoid. The volume bounded by this surface is considered to be the earth’s volume (thus, the volume of that part of the continents which lies above sea level is not included in it). The radius of a sphere of the same volume as the volume of the geoid is taken as the mean radius of the earth. 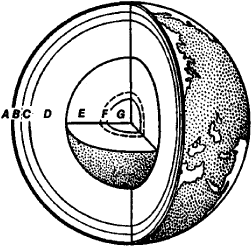 For solving many scientific and practical problems of geodesy, cartography, and other sciences the earth ellipsoid is taken as the shape of the earth. Knowledge of the parameters of the earth ellipsoid, its position in the earth’s body, and also the earth’s gravitational field is very important in astrodynamics, which studies the laws of motion of artificial bodies in space. These parameters are studied by astronomical-geodetic and gravimetric measurements made on the earth and by the method of satellite geodesy. Because of the earth’s rotation, points on the equator have a velocity of 465 m per sec, while points located at latitudes (ø have a velocity of 465 cos ø (m per sec), if the earth is considered to be a sphere. The dependence of the linear velocity of rotation and, consequently, also of centrifugal force on latitude leads to variations in the magnitude of the acceleration of gravity at different latitudes (see Table 4). The earth’s rotation about its axis causes the alternation of day and night on its surface. The period of the earth’s rotation defines the unit of time, the day. The earth’s axis of rotation is tilted at an angle of 23° 26.5’ to the perpendicular to the plane of the ecliptic (in the middle of the 20th century); in the present age this angle is decreasing by 0.47” a year. As the earth moves in its orbit around the sun its axis of rotation retains essentially the same direction in space. This leads to the alternation of seasons. The gravitational influence of the moon, sun, and planets causes long-term periodic changes in the eccentricity of the earth’s orbit and the inclination of the earth’s axis, which is one of the causes of climatic changes over the centuries. The period of the earth’s rotation systematically increases under the influence of lunar and, to a lesser degree, solar tides. The moon’s gravitation creates tidal deformations of both the atmosphere and water shell as well as the “solid” earth. They are directed toward the attracting body and, therefore, move over the earth as it rotates. Tides in the earth’s crust have an amplitude of up to 43 cm, while in the open ocean they are not more than 2 m; in the atmosphere they cause a pressure change of several hundred newtons/m2 (several mm Hg). Tidal friction that accompanies the movement of tides leads to a loss of energy in the earth-moon system and to a transfer of angular momentum from the earth to the moon. As a result the rotation of the earth slows down and the moon moves farther away from the earth. A study of the monthly and annual growth rings in coral fossils has made it possible to estimate the number of days in a year in past geological ages (up to 600 million years ago). Research results indicate that the period of the earth’s rotation about its axis is increasing by an average of a few milliseconds each century (500 million years ago the length of a day was 20.8 hours). The actual slowdown in the velocity of the earth’s rotation is somewhat less than would correspond to the transfer of momentum to the moon. This indicates a secular de-crease in the earth’s moment of inertia that is apparently related to growth in the earth’s solid core or to movement of masses during tectonic processes. The velocity of the earth’s rotation also changes slightly in the course of a year because of seasonal movement of air masses and moisture. Observations of the trajectories of artificial earth satellites have made it possible to determine with a high degree of precision that the earth’s oblateness is somewhat greater than would cor-respond to its present velocity of rotation and distribution of internal masses. It appears that the explanation for this is the high viscosity of the earth’s interior, which leads to a situation in which the earth’s figure does not immediately assume a shape corresponding to the increased period of rotation when the earth’s rotation slows down. Because the earth has an oblate shape (excess of mass at the equator) and the moon’s orbit does not lie in the plane of the earth’s equator, the moon’s gravitation causes precession, a slow turning of the earth’s axis in space. (A complete turn takes 26,000 years.) Superimposed on this motion are periodic oscillations of the direction of the axis, or nutation (basic period of 18.6 years). The position of the axis of rotation in relation to the earth’s body undergoes both periodic changes (in this case the poles deviate from their mean position by 10-15 m) and secular changes (the mean position of the north pole is shifting in the direction of North America at a velocity of ~ 11 cm a year). The outermost and most extended envelope of the earth is the magnetosphere, the area of space around the earth whose physical properties are determined by the earth’s magnetic field and its interaction with streams of charged particles. Research conducted by means of space probes and artificial earth satellites has shown that the earth is constantly located in a stream of solar corpuscular radiation (the so-called solar wind). It forms because of the continuous expansion (escape) of the plasma of the solar corona and consists of charged particles (protons, nuclei, and ions of helium and also heavier positive ions and electrons). Near the earth’s orbit the velocity of the ordered motion of the particles in the stream varies between 300 and 800 km per sec. The solar plasma carries with it a magnetic field whose strength on the average is 4.8 x 103 A/m (6 x 10−5 oersteds). sunward side is localized at an average distance of 13-14 earth radii (R®) from the earth’s center. Behind the shock front is a transition area with a thickness of ~ 20,000 km where the magnetic field of the solar plasma becomes disordered and the motion of its particles becomes chaotic. The temperature of the plasma in this area increases from about 200,000° to ~ 10 million °. 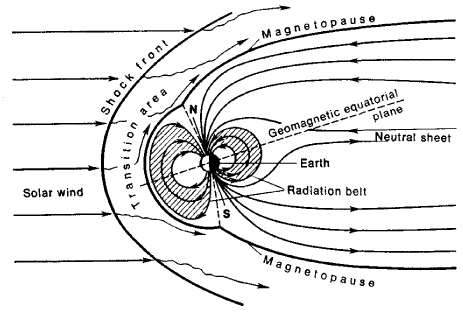 The transition zone directly adjoins the earth’s magnetosphere; the boundary of the magnetosphere, the magnetopause, passes along the line where the dynamic pressure of the solar wind is equalized by the pressure of the earth’s magnetic field. It is located on the sunward side at a distance of ~ 10-12 R® (70,000-80,000 km) from the center of the earth and has a thickness of ~ 100 km. The strength of the earth’s magnetic field at the magnetopause is ~ 8 x 10”2 A/m (103 oersteds), that is, significantly greater than the strength of the solar plasma’s field at the level of the earth’s orbit. The streams of solar plasma particles flow around the magneto-sphere and sharply distort the structure of the earth’s magnetic field at considerable distances from the earth. Up to a distance of approximately 3R® from the center of the earth the magnetic field is still fairly close to the magnetic dipole field (the field strength decreases beginning at an altitude of ~ I/R33®). The regularity of the field here is disturbed only by magnetic anomalies (the influence of the largest anomalies is reflected at altitudes up to ~ 0.5 R® above the surface of the earth). At distances greater than 3R® the magnetic field weakens more slowly than the dipole field, and its lines of force on the sunward side are somewhat compressed toward the earth. The geomagnetic field lines that leave the earth at the polar regions are deflected by the solar wind toward the earth’s night side. There they form a magnetosphere “tail” or “train” more than 5 million km long. Bundles of oppositely directed magnetic lines offeree are separated in the tail by an area of very low magnetic field strength (neutral sheet) where hot plasma with a temperature of millions of degrees is concentrated. The magnetosphere reacts to manifestations of solar activity that causes marked changes in the solar wind and in its magnetic field. A complex set of phenomena occurs that has received the name “magnetic storm.” During such storms there is direct intrusion by particles of the solar wind into the magnetosphere, the upper layers of the atmosphere heat up and ionization intensifies, charged particles are accelerated, there is an increase in the brightness of the auroral displays, electromagnetic noises occur, short-wave radio communication is disrupted, and so on. In the area of closed geomagnetic field lines there is a magnetic trap for charged particles. Its lower boundary is defined by absorption by the atmosphere at an altitude of several hundred kilometers of the particles caught in the trap, while the upper boundary in practice coincides with the boundary of the magnetosphere on the day side of the earth and is somewhat lower on the night side. Streams of high-energy particles (primarily protons and electrons) caught in the trap form the so-called Van Allen radiation belt. The particles of the radiation belt present a significant radiation danger during space flights. The earth’s atmosphere, or air shell, is the name given to the gaseous medium that surrounds the “solid” earth and rotates together with it. The mass of the atmosphere is ~ 5.15 x 1018 kg. The average atmospheric pressure on the earth’s surface at sea level is equal to 101, 325 newtons/nr. (This corresponds to 1 atmosphere or 760 mm Hg.) The density and pressure of the atmosphere decrease rapidly with altitude. At the surface of the earth the mean density of the air is p = 1.22 kg/m3 (number of molecules in 1 cu m is n= 2.5 x 1025), while at an altitude of 10 km p = 0.41 kg/m3(n= 8.6 x 1024), and at an altitude of 100 km p - 8.8 x 10−7 kg/m3 (n = 1.8 x 1018). The atmosphere has a layered structure, and the layers differ in physical and chemical properties (temperature, chemical composition, ionization of molecules, and other factors). The conventional division of the atmosphere into layers is based primarily on change in temperature with altitude, reflecting the balance of basic energy processes in the atmosphere. The lower part of the atmosphere, which contains about 80 percent of its total mass, is called the troposphere. It extends up to an altitude of 16-18 km in the equatorial belt and up to 8-10 km in the polar latitudes. The temperature of the troposphere decreases with altitude by an average of 0.6°K for each 100 m. Above the troposphere, to an altitude of 55 km, is the stratosphere, which contains almost 20 percent of the atmosphere’s mass. It is separated from the troposphere by a transition layer, the tropopause, which has a temperature of 190°-220°K. Up to an altitude of ~ 25 km the temperature of the stratosphere decreases somewhat, but after that it begins to rise, reaching a maximum (~ 270°K) at an altitude of 50-55 km. This rise is due primarily to the increased concentration of ozone in the upper layers of the atmosphere; ozone intensively absorbs the ultraviolet radiation of the sun. Above the stratosphere are the mesosphere (up to 80 km), the thermosphere (from 80 km to 800-1,000 km), and the exo-sphere (above 800-1,000 km). The total mass of all these layers is not more than 0.5 percent of the mass of the atmosphere. In the mesosphere, which is separated from the stratosphere by the stratopause, the ozone disappears and the temperature again drops to 180°-200°K near its upper limit (the mesopause). In the thermosphere there is a rapid rise in temperature, caused primarily by the absorption of short-wave solar radiation. An increase in temperature is ob-served up to an altitude of 200-300 km. Above that, up to approximately 800-1,000 km, the temperature remains constant (~ 1000°K) because the rarefied atmosphere absorbs solar radiation weakly. The outer layer of the atmosphere, the exosphere, is extremely rarefied (at its lower limit the number of protons in 1 cubic meter is ~ 1011) and particles rarely collide. The velocities of individual particles in the exosphere may exceed the critical escape velocity. If they are not hindered by collisions, these particles may overcome the earth’s gravity, leave the atmosphere, and go off into interplanetary space. This is how dissipation of the atmosphere occurs. Therefore the exosphere is also called the sphere of dissipation. It is mainly hydrogen and helium atoms that escape from the atmosphere into interplanetary space. The cited characteristics of atmospheric layers should be considered as averaged characteristics. Depending on the geographical latitude, season of the year, day, and other factors, there may be marked changes in them. The chemical composition of the earth’s atmosphere is not uniform. Dry atmospheric air at the earth’s surface contains, by volume, 78.08 percent nitrogen, 20.95 percent oxygen (~ 10~6 percent ozone), 0.93 percent argon, and about 0.03 per-cent carbon dioxide. Hydrogen, neon, helium, methane, krypton, and other gases taken together do not constitute more than 0.1 percent. In the atmospheric layer up to altitudes of 90-100 km, which is where intensive mixing of the atmosphere occurs, the relative composition of primary components does not change. (This layer is called the homosphere.) The atmosphere contains (1.3-1.5) x 1016 kg of water. The primary mass of atmospheric water (in the form of vapor, suspended drops, and ice crystals) is concentrated in the troposphere, and at higher altitudes the amount of it de-creases sharply. In humid air the content of water vapor at the earth’s surface varies from 3-4 percent in the tropics to 2 x 10−5 percent in Antarctica. The aerosol components of air, including dust of soil, organic, and space origin and particles of soot, ash, and mineral salts, are extremely variable. Near the upper limit of the troposphere and in the strato-sphere the ozone content increases. The layer of maximum ozone concentration is located at altitudes of ~ 21-25 km. Beginning at altitudes of ~ 40 km there is an increase in the content of atomic oxygen. Dissociation of molecular nitrogen begins at altitudes of about 200 km. Together with dissociation of molecules owing to the effect of short-wave and corpuscular radiation from the sun, at altitudes between 50 and 400 km there is ionization of atmospheric gases. The electrical conductivity of the atmosphere depends on the degree of ionization. At altitudes of 250-300 km, where maximum ionization occurs, the electrical conductivity of the atmosphere is 1012 times greater than at the earth’s surface. The upper layers of the atmosphere are also characterized by the process of diffusive separation of gases owing to the action of the force of gravity (gravitational separation): the gases are distributed by altitude in accordance with their molecular mass. As a result, the upper layers of the atmosphere are richer in lighter gases. The processes of dissociation, ionization, and gravitational separation taken together cause the chemical nonuniformity of the upper layers of the atmosphere. Up to about 200 km the main component of air is nitrogen N2. Above that atomic oxygen begins to predominate. At altitudes of more than 600 km helium becomes the dominant component, while in the layer beginning at 2,000 km and above, hydrogen becomes dominant, forming the so-called hydrogen corona of the earth. The electromagnetic radiation of the sun, the main source of energy for the physical, chemical, and biological processes in the earth’s geographic shell, passes through the atmosphere to the earth’s surface. The atmosphere is transparent to electromagnetic radiation in the range of wavelengths λ from 0.3 microns (3,000 angstroms) to 5.2 microns (about 88 percent of all the energy of solar radiation is contained in this range) and the radio band from 1 mm to 30 m. Radiation in the infrared band (λ > 5.2 microns) is absorbed primarily by water vapor and carbon dioxide in the troposphere and stratosphere. The opacity of the atmosphere in the radio band is caused by reflection of radio waves from the ionized layers of the atmosphere (ionosphere). Radiation in the ultraviolet band (λ from 3,000 to 1,800 angstroms) is absorbed by ozone at altitudes of 15-60 km, while waves with lengths between 1,800 and 1,000 angstroms or shorter are absorbed by nitrogen and molecular and atomic oxygen (at altitudes from a few dozen to several hundred km above the earth’s surface). Hard short-wave radiation (X-ray and gamma radiation) is absorbed by the entire breadth of the atmosphere and does not reach the surface of the earth. Thus the biosphere is protected against the lethal effect of short-wave solar radiation. Only 48 percent of the energy of solar radiation that falls on the outer boundary of the atmosphere reaches the earth’s surface in the form of direct and diffuse radiation. At the same time the atmosphere is almost opaque to the earth’s thermal radiation (owing to the presence of carbon dioxide and water vapors in the atmosphere—the greenhouse effect). If the earth did not have an atmosphere the average temperature of its surface would be -23°C, while in fact the mean annual temperature of the earth’s surface is 14.8°C. The atmosphere also stops some cosmic rays and serves as a shield against the destructive action of meteorites. The surface of the moon, which does not have atmospheric protection and is dotted by meteorite craters, shows how important the protective action of the earth’s atmosphere is. There is a continuous exchange of energy (the heat cycle) and matter (the hydrologic cycle, exchange of oxygen and other gases) taking place between the atmosphere and the surface underlying it. Heat exchange includes heat transfer by radiation (radiant heat exchange) and heat transfer through heat conductivity, convection, and the phase transitions of water (evaporation, condensation, and crystallization). The uneven heating up of the atmosphere above land and water at various altitudes and in various latitudes leads to uneven distribution of atmospheric pressure. The persistent drops in pressure that occur in the atmosphere cause the general atmospheric circulation. This is related to the hydrologic cycle, which includes the processes of water evapo-ration from the surface of the hydrosphere, the transfer of water vapor by air currents, and the fall of precipitation and its runoff. The heat cycle, the hydrologic cycle, and atmospheric circulation are basic climate-forming processes. The atmosphere is an active agent in the various processes that occur on the surface of the land and in the upper layers of bodies of water. The atmosphere plays a most important part in the development of life on earth. Water forms a discontinuous shell on the earth. About 94 percent of the total volume of the hydro-sphere is concentrated in the oceans and seas; 4 percent is contained in underground waters; about 2 percent is found in ice and snow (primarily in the arctic, antarctic, and Green-land); and 0.4 percent is found in the surface waters of the land (rivers, lakes, swamps). An insignificant amount of water is contained in the atmosphere and in organisms. All forms of water change from one form into another in the process of circulation. Each year the amount of precipitation falling to the earth’s surface is equal to the amount of water evaporated from the surface of the land and oceans put together. In the overall hydrologic cycle atmospheric waters are the most mobile. The water of the hydrosphere contains almost all the chemical elements. Its average chemical composition is close to the composition of ocean water, in which oxygen, hydrogen, chlorine, and sodium predominate. In land waters the carbonates are dominant. The content of mineral substances in land waters (salinity) varies greatly depending on local conditions, above all on climate. Ordinarily land waters are slightly mineralized, or fresh. (The salinity of rivers and freshwater lakes is from 50 to 1,000 mg per kg.) The average salinity of ocean water is about 35 g per kg (35 °/bo[parts per thousand]), while the salinity of seawater varies between 1-2 °/’oo(Gulf of Finland in the Baltic Sea) to 41.5 °/00(Red Sea). The greatest concentration of salts is found in the salt lakes (Dead Sea up to 260 °/oo) and underground waters (up to 600 %°). The present-day salt composition of the waters of the hydrosphere was formed through the products of chemical weathering of igneous rocks and the introduction to the earth’s surface of products of the degassing of the mantle; in ocean water positively charged ions of sodium, magnesium, calcium, potassium, and strontium are present primarily because of river discharge. Chlorine, sulfur, fluorine, bromine, iodine, boron, and other elements that play the part of anions in ocean water are primarily products of underwater volcanic eruptions. The carbon, nitrogen, free oxygen, and other elements contained in the hydrosphere come from the atmosphere and from living matter on land and in the ocean. Owing to the high content of biogenic chemical elements in the ocean its water serves as a very favorable environment for the development of plant and animal organisms. The world ocean forms the greatest accumulation of water on the earth’s surface. Sea currents connect its separate parts into a single whole, and as a result the waters of the oceans and seas have common physicochemical properties. The surface layer of water in the oceans (to a depth of 200-300 m) has a variable temperature that changes during seasons of the year and depending on temperature conditions in the corresponding climatic belt. The mean annual temperature of this layer gradually drops from 25°C at the equator to 0°C and below in the polar regions. The nature of vertical change in the temperature of ocean water varies greatly de-pending on geographic latitude, which is explained primarily by uneven heating up and cooling of surface waters. On the other hand, vertical change in the temperature of water lying in the same latitudes differs substantially because of currents. The enormous equatorial and tropical expanses of the ocean, however, have much in common in terms of temperature change on the vertical. To depths of 300-500 m the water temperature drops rapidly, then to 1,200-1,500 m the drop in temperature occurs more slowly, while below 1,500 m it hardly changes at all. In the layers near the bottom the temperature usually holds at between 2°C and 0°C. In the temperate regions temperature change on the vertical is less significant because there is less warming up of surface waters. In the polar regions the temperature drops for the first approximately 50-100 m, then to a depth of about 500 m it rises slightly (through addition of warmer and more saline waters from the temperate latitudes), after which it slowly decreases to 0°C and below in the layers near the bottom. The water density changes along with the changes in temperature and salinity. The greatest density is typical of the higher latitudes; there it reaches 1.0275 g/cm3 at the surface. In the equatorial region water density at the surface is 1.02204 g/cm3. A typical feature of the ocean is the circulation and mixing of waters. In the layer down to 150-200 m circulation is determined primarily by prevailing winds, under whose influence powerful oceanic currents form. In deeper layers circulation is related primarily to differences in density that exist in the water stratum depending on temperature and salinity. The main elements of circulation caused by wind action are anticyclone cycles in the subtropical latitudes and cyclone cycles in the high latitudes. Density circulation con-tributes to the vertical distribution of water masses and encompasses the entire stratum of waters. The ebb and flow of tidal currents caused by the influence of the moon and sun is a planetary type of water movement. The ocean plays an enormous part in the earth’s life. It serves as the planet’s main water reservoir and receives most of the solar energy that reaches the earth’s surface. As a result of water’s great heat capacity (and the low heat capacity of air) it exerts a moderating influence on fluctuations in the temperature of the air of the surrounding space. In the temperate and polar latitudes seawater accumulates heat during the summer and discharges it to the atmosphere in the winter. In the equatorial and tropical areas water warms up on the surface all year round. The warm waters are carried by currents from these areas to the high latitudes, thus warming them, while cold waters are returned to the tropics in countercurrents. In this way the ocean influences the earth’s cli-mate and weather. The ocean plays a very important role in the cycle of matter on earth (the hydrologic cycle, mutual exchange with the atmosphere of oxygen and carbon dioxide, deposition on land of salt dissolved in ocean water, supplying of material from the land to the ocean through rivers, and biogeochemical conversions). Interacting with the rocks of the floor and coasts, the continually moving masses of ocean water perform an enormous amount of destructive and creative (accumulative) work. The various types of fragmental and dissolved material received as a result of the destructive work of ocean water and the action of streamflow are deposited on the ocean floor, forming sediments that later are transformed into sedimentary rocks. Dead plant and animal organisms give rise to biogenic sediments. Land water also plays an important role. Fresh water satisfies human needs for water and supplies industry and irrigation farming. Running water on the surface performs a great deal of geological work, eroding, carrying, and depositing the products of the disintegration of rocks. The activity of running water leads to the dissection and general flattening of land relief. The total amount of material carried to the seas and oceans by rivers is estimated to be more than 17 billion tons a year. Knowledge of the structure, composition, and properties of the “solid” earth is primarily hypothetical because only the uppermost part of the earth’s crust is accessible to direct observation. All data about the deeper interior parts of the planet are obtained through various indirect (primarily geophysical) methods of investigation. The most reliable of these are seismic methods based on studying the paths and velocity of the spread of elastic oscillations (seismic waves) in the earth. Using these methods it has been possible to establish a division of the solid earth into separate spheres and to form an idea of the earth’s internal structure (see Table 5). THE STRUCTURE OF THE SOLID EARTH. The outer sphere of the solid earth, the earth’s crust (A), is the most heterogeneous and complexly structured part. Of the several types of crust the most common are the continental and oceanic types. Three layers are distinguished in the structure of the continental crust: the upper, sedimentary layer (from 0 to 20 km), the middle layer, conventionally called the granitic layer (from 10 to 40 km), and the lower, so-called basaltic layer (from 10 to 70 km). The basaltic layer is separated from the granitic layer by the Conrad discontinuity. Beneath the oceans the sedimentary layer over vast areas is just a few hundred meters thick. The granitic layer is generally absent; in place of it there is the so-called second layer, whose nature is unclear. This layer is about 1-2.5 km thick. The thickness of the basaltic layer beneath the oceans is about 5 km. layer. The suboceanic crust is similar to the oceanic crust, differing by a greater thickness overall and a thicker sedimentary layer in particular. The interface between the earth’s crust and the underlying mantle is defined precisely using seismic methods. The mantle consists of three layers (B, C, and D) and extends from the Mohorovicic discontinuity to a depth of 2,900 km, where the earth’s core begins. Layers B and C form the upper mantle (850-900 km thick), while layer D forms the lower mantle (about 2,000 km). The upper part of layer B, which lies directly under the crust, is called the substratum; the crust and the substratum together make up the lithosphere. The lower part of layer B of the upper mantle is named after B. Gutenberg, the seismologist who discovered its properties. The velocity with which seismic waves travel in the Gutenberg layer is somewhat less than in the layers above and below it, which scientists attribute to the increased viscosity of its matter. Hence, the second name for the Gutenberg layer, the asthenosphere (weak sphere). This layer is the seismic wave conduit because the seismic “beam” (path of the wave) travels along it for a long time. The C layer (the Golitsyn layer) beneath is identified as a zone where the velocities of seismic waves increase rapidly with depth (from 8 to 11.3 km per sec for longitudinal waves, from 4.9 to 6.3 km per sec for transverse waves). The earth’s core has a mean radius of about 3,500 km and is divided into the outer core (layer E) and the inner core (layer G), which has a radius of about 1,300 km. They are divided by a transition zone (layer F) with a thickness of about 300 km; this layer is usually considered part of the outer core. At the boundary of the core a sharp drop in the velocity of longitudinal waves (from 13.6 to 8.1 km per sec) is observed. Within the core the velocity increases, jumping to 11.2 km per sec near the boundary of the inner core. In the inner core seismic waves travel with almost constant velocity. PHYSICAL CHARACTERISTICS AND CHEMICAL COMPOSITION OF THE SOLID EARTH. The density, pressure, force of gravity, elastic properties of matter, viscosity, and temperature change with depth within the earth (see Figures 3 and 4). The mean density of the earth’s crust as a whole is 2.8 tons/m3. The mean density of the sedimentary layer of the crust is 2.4-2.5 tons/m3, while for the granitic layer it is 2.7 tons/m3 and for the basaltic layer it is 2.9 tons/m3. At the boundary between the earth’s crust and the mantle (the M discontinuity) the density increases sharply from 2.9-3.0 tons/m3 to 3.1-3.5 tons/m3. After that it increases gradually, reaching 3.6 tons/m3 at the base of the Gutenberg layer, 4.5 tons/m3 at the base of the Golitsyn layer, and 5.6 tons/m3 at the boundary of the core. In the core the density jumps to 10.0 tons/m3 and then increases gradually to 12.5 tons/m3 at the center of the earth. Acceleration of gravity in the earth does not exhibit sudden changes. To a depth of 2,500 km it deviates less than 2 percent from the figure 10 m/sec; at the boundary of the core it is 10.7 m/sec2, and then it decreases gradually to zero at the center of the earth. Pressure is computed on the basis of data on density and the acceleration of gravity; it increases constantly with depth. At the base of the continental crust it is close to 1 giganewton/m2 (109 newtons/m2), while at the base of layer B it is 14 giganewtons/m2, at the base of layer C it is 35 giganewtons/m2, at the boundary of the core it is 136 giganewtons/m2, and at the center of the earth it is 361 giganewtons/m2. Given the density and velocities of seismic waves, values are computed to describe the elastic properties of the earth’s material. Variation in them depending on depth is shown in Figure 4. Figure 4. Elastic properties of the earth’s matter depending on depth: (E) Young’s modulus, (K) bulk modulus, (μ) shear modulus, (σ) Poisson’s ratio. The parts of the curves denoted by broken lines show the probable general shape of the curves. 0.06 watts/m2 or about 2.5 x 1013 watts for the entire surface of the earth). At all places in the mantle the temperature is lower than the temperature of complete fusion of the constituent material. Beneath the continental crust it is believed to be about 600°-700°C. In the Gutenberg layer the temperature appears to be close to the melting point (1500°-1 SOOT). Estimates of temperatures for deeper layers of the mantle and for the earth’s core are extremely hypothetical. It appears that the temperature in the core is not more than 4000°-5000°C. The viscosity of mantle material above and below the boundaries of the asthenosphere is apparently at least 1023 poise (1 poise = 0.1 newton x sec/m2); the viscosity of the asthenosphere is greatly reduced (1019-1021 poise). It is thought that as a result of this a slow mass flow in a horizontal direction is taking place in the asthenosphere under the influence of the uneven load from the earth’s crust (restoration of isostatic equilibrium). The viscosity of the outer core is lower by many orders of magnitude as compared to that of the mantle. Focuses of earthquakes are located in the upper mantle to a depth of 700 km, which indicates the considerable strength of the upper mantle’s constituent material. The absence of deeper seismic focuses is explained by either the low strength of the matter or by the absence of sufficiently strong mechanical stresses. Electrical conductivity in the upper part of layer B is very low (on the order of 10−2 ohm −1 x m −1); in the Gutenberg layer it is greater, which is thought to be related to the increase in temperature. 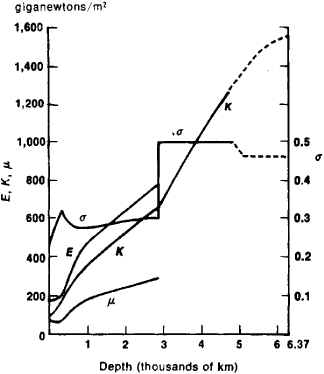 In the Golitsyn layer it gradually increases to about 10-100 ohm −1 x m −1, while in the lower mantle it evidently increases by another order of magnitude. In the earth’s core electrical conductivity is very high, which is an indication of the metallic properties of its matter. It follows from current cosmogonic hypotheses that the chemical composition of the planets and their satellites and meteorites must be similar to the composition of the sun. By comparing the known chemical analyses of earth and moon rocks and meteorites and spectral analyses of the sun and taking into consideration data on the density and other physical properties of material in the interior ot the earth, it is possible to describe the general features of the composition of the earth as a whole and the composition of its various geospheres. Table 6 gives the overall chemical composition of the earth after calculations by the American geochemist B. Mason. It is assumed that the core consists of an ironnickel alloy similar to the metallic phase of chondrites. There are two hypotheses concerning the composition of the earth’s core. According to the first, the core consists of iron with an admixture (18-20 percent) of silicon (or some other relatively light material); according to the second, the outer core is composed of silicate which, under the effect of the enormous pressure and high temperature, has passed into a metallic state; the inner core may be iron or silicate. Iron, oxygen, silicon, and magnesium predominate in the earth’s composition (both in mass and by number of atoms). Taken together they constitute more than 90 percent of the earth’s mass. The earth’s crust is almost half oxygen and more than one-fourth silicon. A large percentage is also composed of aluminum, magnesium, calcium, sodium, and potassium. Oxygen, silicon, and aluminum produce the compounds that are most common in the crust: silica (SiO2) and alumina (A12O3). The mantle consists primarily of heavy minerals that are rich in magnesium and iron. They form compounds with SiO2 (the silicates). The substratum evidently contains more forsterite (Mg2SiO4) than anything else, while at greater depths the amount of fayalite (Fe2SiO4) gradually increases. It is assumed that under the influence of the very high pressure in the lower mantle these minerals have broken down into oxides (SiO2, MgO, and FeO). The aggregate state of matter in the earth’s interior results from high temperature and pressure. The material in the mantle would be molten if it were not for the high pressure that results in the entire mantle being in a hard crystalline state, with the possible exception of the asthenosphere where the effect of a temperature close to the melting point is greater than the effect of pressure. It is assumed that there the substance of the mantle is either in an amorphous state or a partially molten state. In the Golitsyn layer as pressure increases with depth it appears that the crystalline lattices of the minerals are restructured in the direction of greater compaction of atoms, which explains the rapid increase in density and the velocities of seismic waves with depth. GEODYNAMIC PROCESSES. The matter of the earth’s geospheres is continuously moving and changing. These processes take place most rapidly in the liquid and gaseous shells, but the basic content of the history of the globe’s development consists of much slower changes occurring in the internal geospheres that are made up primarily of solid matter; it is precisely the study of their nature and dynamics that is most essential for a correct understanding of the present state and all past states of the earth. Among the processes occurring in the interior and on the surface of the earth two main groups are distinguished. The first is the internal, or endogenic, processes whose driving force is the earth’s internal energy (primarily the energy of radioactive decay). The second group consists of external, or exogenetic, processes engendered by the energy of solar radiation reaching the earth. Endogenic processes are typical primarily for the deep-seated geospheres. In the lower zones of the earth’s crust, in the upper mantle, and, apparently, much deeper there is movement of enormous masses of matter and expansion, compression, and phase transformations of this matter; migration of chemical elements; and circulation of thermal and electric currents. There is no doubt that taken together they cause the continuous process of abyssal differentiation of matter, which leads to concentration of lighter components in the upper geospheres and heavier ones in the deeper geospheres. In the mantle the driving factor is apparently a mechanism resembling zonal fusion as a result of which chemical elements (or compounds) are regularly distributed between fusible and refractory phases. The deep-seated endogenic processes act on the earth’s crust, causing vertical and horizontal movements of particular sectors and blocks (crustal movements) and deformation and transformation of the internal structure of the crust. All these processes are called tectonic processes, and the region in which they occur, which encompasses the earth’s crust and, to a lesser degree, also the outer mantle, is called,,the tectonosphere. Closely interrelated with tectonic processes are magmatic processes, which involve injection into the earth’s crust of magma rising from below (deep-seated magmatism) and outpouring of magma through cracks onto the earth’s surface in the form of lava (volcanism). In the course of tectonic deformations (displacements) and the injection of magma there also occur the processes of rock metamorphism where the mineralogical composition and structure of rocks are altered because of the action of increased pressures and temperatures. The earth’s surface and the upper layers of the earth’s crust are simultaneously subjected to the action of exogenetic processes. They are divided into the destructive (including weathering of rocks, removal of the products of rock destruction by wind and running water, and changes in the earth’s surface caused by rivers and streams, underground waters, and moving glaciers) and constructive (accumulation of sediments in lowlands and sea and lake bodies with subsequent transformation into sedimentary rocks). The actions of endogenic and exogenetic processes on the earth’s surface are mutually reciprocal. Endogenic processes (mainly tectonic movements) first of all create the large-scale irregularities on which the distribution of land and sea and the possibility of moving matter through the force of gravity depend. Exogenetic processes separate and break down uplifted sectors, filling low-lying places with the products of this destruction; in other words, they have an overall tendency to level out the surface of the earth. With the interaction of internal and external processes various types of irregularities are formed on the earth’s surface. Taken together they are called the relief. With different ratios of internal and external forces either mountains and very rugged types of relief are formed or less rugged, level types of relief are created. Under the influence of the combined action of endogenic and exogenetic processes a slow circulation of matter, occurring over millions and billions of years, takes place. It is accompanied by reformation and renewal of the structure of the earth’s crust. Endogenic processes bring deep-lying matter to the earth’s surface, where it encounters the processes of denudation and accumulation and is one of the main sources of material for sedimentary rocks. As the earth’s crust subsides, the sedimentary rocks are drawn into its deep zones and, falling into the sphere of action of abyssal endogenic processes, are sometimes transformed all the way to refusion into magma. Then, in this changed form, they are again raised to the surface of the earth by tectonic processes. PRIMARY FEATURES OF THE STRUCTURE OF THE EARTH’S CRUST. The earth’s crust is the only one of the internal geospheres that is accessible to direct study. Therefore knowledge of its structure is the most important basis for judging not only about the history of development of the earth’s crust but also the history of the earth as a whole. Of the two basic structural subdivisions, the continents and the oceans, which differ fundamentally in type of crusts, the continents have been better studied. The most ancient elements of the structure of the continental crust are the ancient (Precambrian) platforms—vast, tectonically immobile (stable) blocks. In the course of geological history a significant part of their territory has been transformed into plates that are covered by virtually horizontal beds of sedimentary rock (the platform cover) under which the ancient folded basement is buried. The basement emerges on the surface within shields that have no platform cover; it consists of intensively folded metamorphic rocks broken by deep-seated magmatic intrusions, primarily of granitic composition. This indicates that sectors of the crust that are part of the basement originally had high tectonic mobility. The ancient platforms are separated and bordered by technically active geosynclinal belts, which consist of a number of geosynclinal systems, and sometimes include relatively stable internal (median) massifs. As a result of their development some geosynclinal systems have acquired features that are characteristic of platforms and are called young platforms. Unlike the ancient (Precambrian) platforms, their basements are younger in age (Paleozoic or Mesozoic). The geosynclinal belts are characterized by a linear trend (many thousands and tens of thousands of kilometers), increased crustal thickness, contrasting vertical movements of great amplitude, intensive folding of rocks, volcanic activity, and a high level of seismicity. The platforms are marked by an isometric outline, consistency in the thickness of the crust (which is of lesser magnitude than in the geosynclinal belts), slow vertical movements of little amplitude, and weak manifestations of folding, seismicity, and volcanism. The present-day structure of the ocean crust is much less well known, and therefore to a large extent knowledge about it is limited to conjectures. The vast, relatively level expanses of the ocean floor, which are marked by weak volcanism, weak seismicity, and, evidently, low velocities of vertical crustal movement, are called, by analogy with stable continental structures, oceanic platforms, or thalassocratons. They are contrasted with the tectonically mobile zones of the oceanic rift belts, which are spreading structures, completely unique and of global significance, and differ sharply from the geosynclinal folded systems of the continents. They stretch across all the oceans in the form of midoceanic ridges that typically have intensive volcanism, great seismicity, and increased magnitudes of heat flow from the interior. The ridges are complicated by longitudinal faults along which a system of deep rift trenches has developed. Two fundamentally different types of structural relationships between the oceanic and continental crust may be identified. The first type, called the Atlantic type, is typical of a large part of the Atlantic, Indian, and Arctic oceans. Here the boundary between the continent and the ocean cuts across the structure of the continental crust and the transition from the continental to the oceanic crust is abrupt, in the form of a rapid tapering off of the granitic layer in the zone of the continental slope. The second type, called the Pacific type, is typical of the periphery of the Pacific Ocean, the Caribbean and South Hebrides regions of the Atlantic Ocean, and the Indonesian coast of the Indian Ocean. It typically has Mesozoic and Cenozoic folded systems and present-day geosynclines trending parallel to the edge of the continent as if bending round the ocean basin; in addition, it has a more or less wide transition zone with intermediate or mosaic crust structure. In the transition zone there are geanticlinal uplifts that are expressed in the present-day relief as mountainous archi’pelagoes of island arcs with a typical chain shape. Conjugate with them are geosynclinal troughs in the form of the deep-water basins of the marginal seas and long, narrow oceanic trenches. These features of the structure of the Pacific Ocean coast are very often interpreted as evidence of its great antiquity. At the same time no one doubts the relative youth of Atlantic type oceans. Data from historical geology indicate unambiguously that as early as the end of the Paleozoic era the continents of South America, Africa, Australia, and Antarctica, as well as Madagascar and the ancient Hindustan platform, constituted a single continental block, Gondwanaland. Only in the course of the Mesozoic did it break into parts and the present-day basins of the Indian and Atlantic oceans appear. Universal recognition of this fact does not exclude very different interpretations. Some scientists consider it to be the result of “oceanization,” that is, conversion of the continental crust into oceanic crust. The process of oceanization is thought to be related to the formation in the mantle of centers of fusion that assimilate large blocks of the litho-sphere that sink into them. Together with outflows of basalt onto the surface this leads to the disappearance of the granitic layer, a general increase in the weight of the crust, and the formation of an oceanic depression in the place where the former continent existed. On the other hand, views which hold that the oceans formed as blocks of continental crust moved apart and the underlying substratum was exposed are becoming increasingly common. These ideas of continental drift (mobilism) are supported by the data of paleogeography, because unless they are accepted it is difficult to explain the discrepancy between the location of the climatic zones of the geological past and the present-day geographic poles. Similar arguments are also presented based on the discrepancy between the paleomagnetic latitudes and orientation of magnetic meridians in the past calculated on the basis of data on the remnant magnetization of rocks and the present-day position of the magnetic poles. The most widespread of the mobilist hypotheses is the hypothesis of the so-called new global tectonics, or plate tectonics, which was advanced in the 1960’s and is based on geophysical investigations of the oceans. This hypothesis assumes a kind of two-sided “spreading” of the oceanic crust in both directions from the midoceanic ridges and a related expansion of the ocean basins. Some scientists consider it possible that “spreading” of the crust and “oceanization” coexist in different places depending on the situation. Increasing attention is also beginning to be given to the considerable horizontal displacements of blocks of the earth’s crust in the development of normal geosynclinal belts; the presence in the geosynclinal belts of vast zones of ultrabasic igneous rocks and the so-called initial basaltic volcanism typical of the beginning stages of the development of geosynclinal systems are viewed as indicators of the occurrence of geosynclines in the oceanic crust similar to presentday oceanic trenches. According to such ideas the presently known fold systems of the geosynclinal belts are nothing but marginal structures of once-vast ocean basins that were later closed by the overthrust of adjacent continental blocks which gradually approached each other until they joined. Thus the problem of the historical relationships between the continental and oceanic crust is far from being solved. This is even more true of the general causes of tectonic processes, a subject on which there are many hypotheses that are frequently contradictory. THE EARTH’S RELIEF. The largest (planetary) forms of the earth’s relief correspond to the largest structural elements of the earth’s crust. Their morphological differences are determined by differences in the structure and history of particular sectors of the earth’s crust and by the direction of tectonic movements. These subdivisions of the relief of the earth’s surface, in whose formation internal processes play the leading part, are called morphostructures. Planetary-scale morphostructures are broken down into smaller forms of morphostructures, such as individual uplands, mountain ranges, massifs, plateaus, and basins, which are still relatively large relief forms. Superimposed on them are the various smaller forms, the so-called morphosculptures, which are shaped primarily by the effect of the earth’s external forces that are fed by the energy of the sun. Morphostructures The greatest irregularities on the earth’s surface are formed by continental prominences (land together with the shelf) and ocean basins. The largest elements of land relief are plains regions in platforms and mountain (orogenic) regions. Plain-platform regions include the plains regions of ancient and young platforms and occupy about 64 percent of the land area. They are predominantly surfaces that were initially plains, formed by beds of sedimentary rock occurring almost horizontally. There is a symmetry in the distribution of these regions; they are located in two latitudinal belts, one of which is in the northern hemisphere and the other in the southern. The North American, East European, and Siberian plains are located in the northern hemisphere, while the South American (Brazilian), African-Arabian, and Australian plains are in the southern. Within the platform plains there are individual lowlands and uplands, plateaus and high plateaus, and greatly uplifted blocks (the Zhiguli Mountains on the East European Plain, the Putorana Mountains on the Central Siberian Plateau, and the Ahaggar mountain massif on the African-Arabian platform plain). Overall the amplitude of elevation of the surface of platform plains is 10-20 times less than in mountain lands. Among the plain-platform regions there are low ones with absolute elevations of 100-300 m (East European, West Siberian, Turan, and North American) and high ones that have been uplifted by very recent crustal movements to elevations of 400-1,000 m (Central Siberian Plateau, African-Arabian, and Hindustan plains and significant parts of the Australian and South American plains regions). Plains of the second type predominate in land relief. The low and high plains differ markedly in morphological appearance. Unlike the low plains, high plains typically have a greater depth of dissection, more step-like surfaces caused primarily by displacements along faults, and, in places, manifestations of volcanism. A distinction is made between ancient platform plains that formed on Precambrian platforms (for example, the East European) and young plains that have formed on young platforms (for example, the West Siberian) and are more mobile than the former. Mountain (orogenic) regions occupy about 36 percent of the land area. Within them are two types of mountain structures: young, or epigeosynclinal, mountains, which appeared for the first time in the orogenic phase of the development of Cenozoic geosynclinal systems (the mountains of southern Eurasia and western North and South America) and rejuvenated, or epiplatform, mountains, which formed as a result of rejuvenation by recent crustal movements in places where ancient folded regions of various ages had been leveled or partially destroyed (for example, the Tien-Shan, the Kunlun Mountains, the mountains of southern Siberia and northern Mongolia in Asia, the Rocky Mountains in North America, and the highlands of eastern Africa). In terms of area rejuvenated mountains predominate over young mountains because of the enormous extent of epiplatform orogeny in the neotectonic phase of development of the earth’s crust (Neocene-Anthropogene). In mountains of this type uplifted sectors of ancient peneplanation plains are preserved from the age that preceded the most recent mountain building. Unlike the young mountains, they are characterized by discordances between the orographic plan, structure of the drainage system, and the geological structure. The ocean floor is subdivided into the underwater margins of the continents, the zone of island arcs, or transition zone, the ocean bed, and the midoceanic ridges. The underwater margins of the continents (about 14 percent of the earth’s surface) include the shallow and generally level zone of the continental shelf, the continental slope, and the continental rise located at depths from 2,500 to 6,000 m. The continental slope and continental rise separate the continental prominences formed by the land and shelf taken together from the main part of the ocean floor, called the ocean bed. The island arc zone. The ocean bed does not border directly on the continental rise in all regions of the globe. In the western margins of the Pacific Ocean, in the area of the Malay Archipelago, the Antilles Islands, and the Scotia Sea, and in certain other regions that still have a geosynclinal regime, a transition zone is located between the continent and the ocean bed; it is marked by considerable breadth and uplifted sections of the floor suddenly giving way to deeply sunken sections. In these regions there are archipelagoes of island arcs, basins of marginal seas (for example, the Bering Sea and the Sea of Okhotsk) and mountains and elevations within them, and deep-water trenches. The island arcs are young mountain structures that rise above the water in the form of a chain of islands (the Kuril, the Sunda, the Antilles, and others); the deep-water trenches are long, narrow depressions in the ocean floor that ring the island arcs on the ocean side and are 7-11 km deep. Some island arcs consist of two parallel ranges (for example, the Kuril arc) or are replaced by a chain of young mountains located along the margin of the continent (for example, the Cordilleras on the Pacific Coast of America). The island arc zone exhibits the greatest contrast of relief on the earth. The largest part of the ocean bed proper (which comprises about 40 percent of the earth’s surface) is covered with abyssal plains (average depth 3,000-4,000 m) that correspond to ocean platforms (thalassocratons). There are flat (subhorizontal), sloping, and hilly plains with variations in elevation (for the last-named) of up to 1,000 m. Plains form the floor of particular basins that are separated in sublatitudinal and submeridional directions by underwater rises, swells, and ridges. Among the plains expanses of the ocean bed numerous isolated underwater mountains (volcanoes) rise, and some of them have flattened peaks (guyots). The largest elements of the underwater relief are the midoceanic ridges (about 10 percent of the earth’s surface). Their total length is more than 60,000 km. They are gently sloping wavelike uplifts that are from several dozen to 1,000 km wide and rise 2-3 km above the floor of the neighboring basins. Certain peaks of the ridges rise above sea level in the form of volcanic islands (for example, Tristan da Cunha, Bouvet, and St. Helena). Some elements of the system of median ridges are marked by relatively low elevations (low midoceanic ridges), by an absence of rift dislocations, and by less dissection. Each of the median ridges has its own continuation in the region of continental-type crust: the rift dislocations of the East Pacific Rise can be traced in the structures of the California coast in the United States; the dislocations of the Mid-Indian Ridge can be followed in the graben rifts of the Gulf of Aden, the Red Sea, and the fractures of East Africa; and the dislocations of the Mid-Atlantic Ridge continue to the island of Spitsbergen. Abyssal fractures that cut up the earth’s entire crust and frequently extend into the mantle play a highly significant role in the structure of the earth’s surface. They divide the crust into individual blocks that are well expressed by their relief. They are related, in particular, to the rectilinear sections in the outlines of the continents. On the ocean floor the largest fractures stretch for thousands of kilometers in latitudinal and sublatitudinal directions and are expressed in the relief in the form of scarps, narrow basins, and ridges rising above them. These fractures cross the midoceanic ridges, breaking them into individual segments that are displaced dozens and hundreds of kilometers relative to each other. Morphosculptures. The work of rivers and temporary flows of water plays the largest part in the formation of morphosculptures. Rivers and temporary streams create the common fluvial (erosion and accumulative) forms (river valleys, ravines, gullies, and the like). Also common are glacial forms caused by the activity of present-day and ancient glaciers, especially continental glaciers (the northern part of Eurasia and of North America). Glacial forms are represented by valley troughs, “sheep-back” rocks, morainic ridges, eskers, and the like. Various forms of permafrost (cryogenic) relief have developed over enormous areas of Asia and North America where perennially frozen rock strata are common. The desert and semidesert regions of the earth typically have so-called arid forms; intensive physical weathering and the action of the wind and temporary streams play a decisive part in creating them. External processes on the land are caused to a significant degree by the climatic features of a locality; therefore, the areas where morphosculptures of a particular type are found are distributed quite regularly over the surface of the earth. On the ocean floor morphosculptures are formed through the influence of coastal abrasive-accumulative processes, the action of turbidity (suspension) currents, and the action of currents along the bottom. The most important feature of the earfn as a planet is the presence of the biosphere, the shell whose composition, structure, and energetics are caused to a significant degree by the activity of living organisms. The boundaries of the biosphere are understood differently depending on the approach to its study. The significance of this shell was revealed most fully in the theory developed by V. I. Vernadskii. The biosphere includes not only the area on the surface where life is now concentrated but also the parts of other geospheres into which living matter penetrates or which are transformed as a result of the past activity of living matter. Thus the biosphere includes not only living organisms but also all their present and past habitats. According to V. I. Vernadskii this “sphere of life” is joined together by the biogenic migration of atoms. Living matter actually manifests itself in the form of particular (discrete) living organisms which differ in composition, structure, and way of life and belong to different species. There are from 1.2 to 2 million (according to various data) species of plants and animals on the earth. Of them, plants have about one-fourth or one-third of the total number of species. Among the animals insects hold first place for number of species described (about 750,000), while mollusks are second (from 40,000 to 100,000 according to various data). Then come the vertebrates (60,000-70,000). Among the plants the angiosperms are first (from 150,000 to 300,000 species according to various data), followed by the fungi (from 70,000 to 100,000 species). The number of plant and animal species is the measure of the richness of the flora and fauna. But an abundance of species by itself does not mean an abundance of individuals, just as a small number of species of flora and fauna may be accompanied by a great abundance of individuals. To characterize vegetation and the animal world, therefore, the concepts of biomass (total mass of organisms) and biological productivity (the ability of organisms to reproduce the biomass in a unit of time per unit of area or volume of habitat) are used instead of the concepts of flora and fauna. Organisms are distributed differently by biomass than they are by number of species; the biomass of plants on land is significantly greater than that of animals. The biosphere, as the area of greatest variability observable on earth in the conditions and state of matter, includes solid, liquid, and gaseous matter and has a mosaic structure that is based on various biogeocenoses—groups of living organisms and inorganic components that are interrelated through exchange of matter and energy. The biogeocenosis is a single organized system capable of self-regulation. The matter of the biosphere is not homogeneous in structure; it is divided into living (organisms), biogenic (created by living organisms), bioinert (the result of the combined action of biological and inorganic processes), and inert (inorganic). The geological role of living matter is manifested in a number of biogeochemical functions. By means of living organisms (primarily through photosynthesis) solar energy is introduced into physicochemical processes of the earth’s crust and then redistributed through the nutrition, respiration, and reproduction of organisms, drawing large masses of inert matter into the process. Living organisms have spread to all regions of the earth accessible to them that are close to regions where liquid water is thermodynamically stable (with the exception, apparently, of regions where underground waters are overheated) and to a number of regions with temperatures below 0°C. The environmental conditions in which the vital activity of organisms is possible—the field of stable life—is expanding as vital activity becomes increasingly adaptable in the course of evolution. During the earth’s evolution the boundaries of the biosphere have expanded through direct adaptation by organisms to harsher conditions and also through the creation of protective shells within which special conditions arise that differ from environmental conditions. This process has taken on the greatest scope since the appearance of human beings, who are capable of significantly expanding the sphere they inhabit. The most unique and typical features of the earth are in the geographic (landscape) sphere, which, despite its small relative thickness, contains the earth’s most vivid individual traits. In this sphere not only do the three geospheres—the lower sections of the atmosphere, the hydrosphere, and the earth’s crust—come into close contact, but there is also partial mixing and exchange of solid, liquid, and gaseous components. The landscape sphere absorbs the major part of the sun’s radiant energy in the visible wave band and receives all other space effects. Tectonic movements resulting from the energy of radioactive decay in the earth’s interior, the recrystallization of minerals, and other processes manifest themselves in this sphere. The energy of various sources (primarily the sun) undergoes numerous transformations in the landscape sphere, becoming converted into thermal, molecular, chemical, kinetic, potential, and electrical forms of energy. As a result, the heat flowing from the sun is concentrated here and diverse conditions for living organisms are created. The geographic shell is characterized by the wholeness resulting from the relation-ships among its components and by unevenness of development in time and space. The unevenness of development in time is expressed in the directed rhythmic (periodical—daily, monthly, seasonal, annual) and nonrhythmic (episodic) changes typical of this shell. As a result of these processes particular sectors of the geographic shell have differing ages, the course of natural processes has an inherited aspect, and relict features are pre-served in existing landscapes. A knowledge of the principal rules of development of the geographic shell enables us to forecast natural processes in many cases. Owing to the variety of conditions created by the relief, waters, climate, and life, the landscape sphere is spatially more strongly differentiated than the external and internal geospheres (except for the outer part of the earth’s crust) where matter in horizontal directions is relatively homogeneous. The unevenness of the geographic shell’s development in space is expressed, first of all, in horizontal zonation and altitudinal zonation. Local features (conditions of exposure, the role of mountain ranges as barriers, distance from oceans, specific features of the development of the organic world in particular regions of the earth) complicate the structure of the geographic shell, promote the development of azonal, intrazonal, and provincial differences, and lead to the uniqueness of particular regions and of their combinations. The types of landscape that occur in the landscape sphere differ by ranks. The largest division is related to the existence and distribution of continents and oceans. Next the division is due to the spherical shape of the earth, manifesting itself in different amounts of thermal energy reaching the earth’s sur-face. Owing to this the temperature zones, which are distributed in circumpolar fashion, form—one torrid zone, two temperate zones, and two frigid zones. But heat differences do not determine all the fundamental features of a landscape. The combination of the earth’s spherical shape and its rotation about its axis creates marked dynamic differences, in addition to thermal ones, which arise primarily in the atmosphere and hydrosphere but extend their influence to land as well. Thus climatic zones are formed, each with its own special heat conditions and its own air masses and characteristics of their circulation, and as a result, unique manifestation and rhythm of a number of geographic processes: biogeochemical processes, geomorphological processes, evaporation, plant growth, animal migration, and the cycles of organic and mineral matter. In the polar (arctic and antarctic), temperate, tropical, and equatorial zones air masses having the same names form and predominate or prevail throughout the entire year. Between these zones are transition zones where air masses of the adjacent zones alternate in a regular manner throughout the year; this is reflected in the names of the transition zones having the prefix “sub” (subpolar, subtropical, and sub-equatorial zones). Latitudinal climatic zonation has such a fundamental influence on other aspects of the landscape that the division of the natural world into physicogeographical zones on the basis of the entire complex of features virtually corresponds to the climatic zones, generally coinciding with them in number, configuration, and name. The geographic zones differ substantially in many features in the northern and southern hemispheres, thus permitting us to speak of the geographic shell’s asymmetry. Further differences of horizontal zonation are directly dependent on the dimensions and configuration of the land and related differences in the amount of moisture and the regime of moistening. Here the influence of sectorial differences between ocean-shore, transitional, and continental parts (sectors) of the continents is most marked. It is precisely in the concrete conditions of particular sectors that the heterogeneous areas of geographic zones on land, which are called physicogeographical zones, form. Many of them have the same names as vegetation zones (forest and steppe, for example), but this only reflects the physiognomical representation of the plant cover in the landscape’s appearance. Horizontal zonation within different geographic zones manifests itself in various ways. Particular zones and sub-zones of the polar and subpolar belts extend latitudinally and give way to one another in a circumpolar manner. In the temperate zone, which is well-developed on land primarily in the northern hemisphere, the latitudinal extent of zones is typical only of the continental sector. In the transitional sectors the trend of zones becomes diagonal in relation to the map grid, while in the zones near the ocean, especially in the lower latitudes, zones give way to one another with longitude. Examples of physicogeographical zones in the northern hemisphere are the zones of ice and arctic deserts in the arctic belt; the tundra zone (with subzones of arctic, mosslichen, and brush tundra) and forest-tundra zone in the subarctic belt; and the forest zone (with subzones of sparse forest, several types of taiga, and mixed and deciduous forests), the forest-steppe zone, the steppe zone (with sub-zones of steppes with various grasses and arid steppes), the semidesert zone, and the desert zone (with subzones of northern and southern deserts) in the temperate belt. In the subtropical belts the zones give way to one another primarily with longitude; for example, in the subtropical regions of Eurasia and northern Africa the zones from west to east are moist forested subtropics, semiarid (Mediterranean Sea) forest-brush subtropics, and subtropical zones of forest-steppe, steppes, semideserts, and deserts. The tropical belts are primarily in the interior sectors of the continents. In the subequatorial belts, depending on the configuration of the land, there are complex combinations of division into latitudinal zones (from dry and more moist savannas and sparse forests to monsoon forests) and into heterogeneous sectorial landscape variants (forested in oceanic sectors and arid savanna in continental sectors). In the equatorial belt differences are primarily sectorial. There are some spatial analogies in the ratios of heat and moistening in the zones; thus, zones with a relative balance between heat and moistening, where there is exactly enough heat to evaporate the moisture that is not removed by runoff, are regularly repeated in various belts (forest-steppe, savanna). Belts similar to the geographic zones of the land are also found in the world ocean. Their position is determined by heat, evaporation, cloudiness, and the salinity and density of water, which are all basically functions of the radiation balance; prevailing winds and sea currents; and vertical circulation of water and its content of oxygen, plankton and higher organisms, and benthos on the bottom. Usually these conditions change gradually with latitude, while sea currents, which are subject to the Coriolis force and move in accordance with the outlines of the shores, go beyond the boundaries of the belts of prevailing winds and exert a substantial influence in other belts. In determining the boundaries of geographic zones in the ocean, therefore, the lines of convergence of the main water masses, the edges of old (in the summer) and seasonal (in the winter) ice in the polar regions, and the latitudinal axes of the centers of atmospheric action are more important. In the areas on both sides of these axes the winds (with a prevailing west-east movement) have opposite directions. The earth’s geological history is reconstructed on the basis of a study of the rocks that make up the earth’s crust. The absolute age of the most ancient rocks known at the present time is about 3.5 billion years, and the age of the earth as a planet is estimated to be 4.5 billion years. The formation of the earth and the initial stage of its development belong to pre-geological history. The geological history of the earth is divided into two unequal stages: the Precambrian, which takes up about fivesixths of all geological history (about 3 billion years), and the Phanerozoic, which encompasses the last 570 million years. The Precambrian is divided into the Archean and Proterozoic eras. The Phanerozoic includes the Paleozoic, Mesozoic, and Cenozoic eras. The best-studied history is that of the continental part of the earth’s crust, within which, about 1.5-1.6 billion years ago, the formation of the ancient (Precambrian) platforms that constitute the principal masses of the present continents was basically completed. These platforms are the Eastern European (Russian) in Europe; the Siberian, Sino-Korean, South China, and Indian in Asia; the African; the Australian; the South American and North American (Canadian); and the Antarctic. To a significant degree the history of the continental part of the earth’s crust is determined by the development of its geosynclinal belts, which consist of particular geosynclinal systems. The evolution of all the geosynclinal systems begins with a prolonged geosynclinal phase of formation and development of deep subparallel troughs, or geosynclines, separated by uplifts (geanticlines) and usually filled by seas in whose waters thick strata of sedimentary and volcanic rocks were deposited. Then the geosynclinal system underwent intensive folding that transformed it into a folded system (folded structure), entered the stage of mountain building (orogeny), and was thrust upward in its entirety to form a mountainous belt. In this concluding orogenic phase mostly coarse deposits accumulated in the newly formed internal (intermontane) basins and the marginal troughs (foredeeps) which formed along the periphery of the neighboring platforms; and here the so-called orogenic volcanism related to fractures of the earth’s crust developed over vast areas. With the end of the orogenic phase the folded system lost its former tectonic mobility, its relief was gradually leveled by denudation, and it became the basement of a young platform within which sectors subsequently developed that were overlaid by a newly deposited platform mantle (plates or plity). The development of most of the Phanerozoic geosynclinal systems fits within the framework of a few generalized global tectonic cycles. Although in different cases the beginnings and ends of the tectonic cycles differ by tens of millions of years, on the whole they are natural units in the overall evolution of the structure of the continental crust. Two of them, the Caledonian and the Hercynian cycles, fall in the Paleozoic era (570-230 million years ago). The Caledonian and Hercynian foldings that ended them shaped the basements of the most extensive and most typically built of the young Epipaleozoic platforms. All subsequent tectonic history is often viewed as a single Alpine cycle. But it clearly breaks down into particular cycles of less than universal significance that overlap each other chronologically to a considerable degree but have entirely independent significance in the development of definite regions of the globe. The first of these cycles is most characteristic for the geosynclinal belt that surrounds the Pacific Ocean. It began in the last segment of the Paleozoic era, the Permian period, and coincides in time with the concluding stages of the Hercynian cycle in other regions. But the main part falls in the Mesozoic era (230-70 million years ago), which is why the cycle itself and the folding that ended it are usually called Mesozoic. Mesozoic folded systems are still marked by mountain relief today, and true Epimesozoic plates with well-developed platform mantles are uncommon. The second cycle of development, the Alpine cycle proper, is most typical for the Mediterranean geosynclinal belt that stretches from southern Europe through the Himalayas to Indonesia; it had less typical manifestations in some of the geosynclinal systems of the Pacific coastline. The beginning of this cycle falls in the early Mesozoic, and it ended in different segments of the last era of the geologic past, the Cenozoic. Developing geosynclines (for example, the deep-water troughs of Mediterranean-type inland seas) exist today in just a few Alpine geosynclinal systems. A large majority of them are undergoing an orogenic phase and are the sites of high, intensively growing mountain systems, regions of young Cenozoic, or Alpine, folding. Present geosynclinal systems (or regions) are concentrated primarily on the western periphery of the Pacific Ocean and, to a lesser degree, in other regions near oceans. Sometimes they are also considered part of the areas of Cenozoic folding, although they are in the most active stage of geosynclinal development. After completion of the cycle geosynclinal development may repeat itself, but some part of the geosynclinal regions always becomes a young platform at the end of a regular cycle. For this reason the area occupied by geosynclines has decreased in the course of geological history, while the area of platforms has increased. It is precisely the geosynclinal systems that have been the place where the continental crust with its granitic layer has formed and grown. The periodic nature of vertical movements in the course of the tectonic cycle (primarily subsidence in the beginning and primarily uplift at the end of the cycle) has in every case led to corresponding changes in the relief of the surface and to a change in the transgressions and regressions of the sea. These- same periodic movements have affected the nature of the sedimentary rocks that were deposited and also the climate, which has experienced periodic changes. Even in the Precambrian, warm epochs were interrupted by ice ages. At times during the Paleozoic, glaciation engulfed Brazil, South Africa, India, and Australia. The most recent glaciation (in the northern hemisphere) occurred during the Anthropogenic period. In general, the first half of each tectonic cycle on the continents saw an advance by the sea, which inundated an everincreasing area on the platforms and in the geosynclines. In the Caledonian cycle the transgression of the sea developed during the Cambrian and Ordovician periods; in the Hercynian cycle it developed in the course of the second half of the Devonian period and at the beginning of the Carboniferous period; in the Mesozoic it developed during the Triassic period and at the beginning of the Jurassic; in the Alpine it developed in the course of the Jurassic and Cretaceous periods; and in the Cenozoic it developed during the Paleogene. At first the deposition of sandy-argillaceous sediments predominated in the seas, but as the area of the seas increased these sediments gave way to limestones. When crustal uplifts became predominant in the middle of the cycle the sea began to retreat, the land area increased, and mountains arose in the geosynclines. At the end of the tectonic cycle in virtually all places the continents were freed of sea basins. The nature of the sedimentary rocks that occurred in the basins changed accordingly. At first they were still marine sediments, but sands and clays, not limestones. The rocks became increasingly coarse-grained. At the end of the tectonic cycle marine sediments in virtually all places were replaced by continental sediments. In the Caledonian cycle this process of change toward greater coarseness and finally to continental sediments occurred in the Silurian period and the beginning of the Devonian; during the Hercynian cycle it was at the end of the Carboniferous, in the Permian period, and at the beginning of the Triassic period; during the Alpine cycle it was in the Cenozoic; during the Mesozoic cycle it was in the Cretaceous period; and during the Cenozoic cycle it was in the Neocene. At the end of the cycle chemogenic lagoonal deposits (salt and gypsum) also formed as residual products from evaporation of the water of closed and shallow sea basins. The periodic changes in the conditions of formation of sediments led to similarity between sedimentary formations belonging to identical stages of different tectonic cycles. And this led in a number of cases to the repeated occurrence of mineral deposits of sedimentary origin. For example, the largest coal deposits date to that stage in the Hercynian and Alpine cycles when uplift had just begun to prevail over submersion of the earth’s crust (the middle and end of the Carboniferous in the Hercynian cycle and the Paleogene in the Alpine cycle). The formation of large deposits of common and potassium salts dates to the end of the tectonic cycle (the end of the Silurian period and the beginning of the Devonian in the Caledonian cycle, the Permian period and the beginning of the Triassic in the Hercynian, and the Neocene and Anthropogenic periods in the Alpine cycle). However, the similarity among sedimentary formations belonging to the same stage of different cycles is not complete. Because of the onward evolution of the animal and plant world from cycle to cycle the rock-forming organisms changed and the nature of the influence of organisms on rocks also changed. For example, the absence of an appropriate vegetative cover on the continents in the early Paleozoic was the reason why the Caledonian cycle did not have the coal deposits that were typical of the Hercynian and later cycles. The objective laws of development of the continental crust are not limited to transformation of tectonically mobile zones into platforms. Many geosynclinal systems, for example, in the Verkhoiansk-Kolyma region and in a significant part of the Mediterranean geosynclinal belt, formed in the bodies of more ancient folded structures, including ancient platforms whose remnants are seen in certain internal masses. Along with such assimilation of the sections of neighboring platforms by geosynclinal systems, vast zones within the latter experienced occasional tectonic activation expressed in considerable relative vertical displacements of large blocks along fracture systems and general uplifts leading to the appearance of mountain relief in place of formerly level areas. Such epiplatform orogeny differs greatly from the epigeosynclinal orogeny described above by the absence of true folding and the phenomena of deep-seated magmatism that accompany folding, as well as by weak manifestation of volcanism. In the course of geologic history the platforms have been engulfed by the processes of tectonic activation numerous times. These processes were particularly striking at the end of the Neocene when high mountains that had formed as far back as the end of the Caledonian or Hercynian cycles and had been leveled since then were again uplifted on the platforms (for example, the Tien-Shan, the Altai, and the Saians); at the same time major graben-rift systems formed on the platforms, indicating a process of deep-seated cleaving of the earth’s crust (the Baikal system of rifts, the East African fault zone). The process of decrease in the area occupied by geosynclines and the corresponding growth in the area of platforms was subject to a certain spatial regularity: the first stable platforms that formed in the middle Proterozoic in place of the Archean geosynclines subsequently played the role of “centers of stabilization,” which were overgrown by increasingly younger platforms on the periphery. As a result, by the beginning of the Mesozoic geosynclinal conditions were preserved in two narrow but extended belts the Pacific Ocean and Mediterranean Sea belts. Influenced by the interaction between internal and external forces, the natural world on the earth’s surface has changed throughout all geologic history. There have been numerous changes in relief, outlines of the continents and oceans, climate, vegetation, and animal world. The development of the organic world was closely linked with the main phases in the development of the earth, which included lengthy periods of relatively peaceful development and periods of comparatively short-term restructuring of the earth’s crust accompanied by changes in physicogeographical conditions on its surface. History of the development of the organic world. Concerning the appearance of life on earth and the initial stages of its development we can only make hypotheses (for example, A. I. Oparin’s hypothesis of the origin of life). Biological evolution was preceded by a lengthy phase of chemical evolution that involved the appearance of amino acids, proteins, and other organic compounds in water basins. The early atmosphere evidently consisted predominantly of methane, carbon dioxide, water vapor, and hydrogen; oxygen was in a bound state. In one of the stages of development complex organic molecules acquired the ability to create molecules like themselves, that is, they became the first organisms; they evidently consisted of protein and nucleic acids and were capable of having inheritable variations. Under the influence of natural selection the more perfected initial living organisms survived; at first they fed on organic substances (heterotrophic organisms). Later there appeared organisms capable of synthesizing organic substances from inorganic substances through chemosynthesis or photosyn-thesis (autotrophic organisms). Free oxygen, a by-product of photosynthesis, accumulated in the atmosphere. After the appearance of autotrophic organisms broad opportunities for the evolution of plants and animals came into being. The history of life is reconstructed on the basis of the remains of animals and plants and traces of their vital activity that have been preserved in sedimentary and, very rarely, metamorphic rocks. The fossil remains of organisms that once populated the earth provide a unique chronicle of life’s development on earth over the course of many millions of years. This geological chronicle is far from perfect and is quite incomplete because a large number of organisms, especially those without skeletons, disappeared without a trace. An enormous stage in terms of time, the Precambrian, or Cryptozoic (about 3 billion years), has left very little paleontological documentation. The most ancient traces of the vital activity of organisms have been found in Archean rocks whose age is determined to be from 2.6 to 3.5 and more billion years; they are represented by the remains of bacteria and blue-green algae. More varied organic remains have been found in rocks of the Proterozoic, which was the age when bacteria and algae dominated. In the Lower Proterozoic life is represented primarily by products of the vital activity of algae (stromatolites) and bacteria (in particular, the iron bacteria, which formed some ore deposits). It appears that the first multicellular animals arose in the Proterozoic because imprints and nuclei of a number of invertebrate animals—sponges, jellyfish, corals, worms, and some other organisms whose systematic position is unclear—have been found in deposits from the end of the Proterozoic (the Wend complex, and Ediacara in southern Australia). Because of the predominance of jellyfish remains the end of the Proterozoic is called the age of jellyfish. Apparently, other organisms also existed during the Proterozoic because the deposits of the early Paleozoic show remains and traces of the vital activity of representatives of virtually all the types in the animal kingdom, providing evidence that the appearance and formation of many types took place much earlier. It is possible that all the organisms of the Proterozoic did not yet have hard skeletons, and therefore very little is known about them. By the end of the Cryptozoic major paleogeographic changes linked to the end of the Baikalian tectonic cycle had taken place. It is likely that by this time the composition of the atmosphere had also changed as a result of the extensive development of photosynthesizing plants (the oxygen content increased and the carbon dioxide content decreased accordingly), and the chemical composition of seawater had changed too. The appearance of a number of organismic groups with organic or mineral skeletons, which took place at the end of the Precambrian and beginning of the Phanerozoic, was an exceptionally important event in the history of the development of the organic world. The numerous organic remains in Phanerozoic deposits enable us not only to reconstruct the history of development of the organic world but also to subdivide it into definite stages (eras, periods, and so on); moreover, they help in carrying out a paleogeographic reconstruction (determining the boundaries of seas and continents and climatic zones, reconstructing the history of marine ba-sins and continents, and clarifying the way of life and conditions of the existence of organisms in the past). Evolution occurred as a process of adaptation, and its main factors were inheritable variations, the struggle for survival, and natural selection. The specific paths of evolution differed. Sometimes there were very important qualitative changes in organisms (for example, the appearance of warm-bloodedness), usually called aromorphoses, which led to a general increase in the degree of organization and to the appearance of fundamentally new relationships with the environment. The more usual path of evolution was the formation of adaptations not related to any substantial changes in organization but promoting broader distribution of the organisms and adaptation to more varied conditions (idioadaptations). Aromorphoses and idioadaptations are two sides of one and the same process of adaptation. Study of the organisms of the geological past has made it possible to establish the varying speed of evolution as a whole and also the varying speed of evolution for different types of plants and animals. Evolution generally moved from the simple to the complex, but sometimes in the process of adapting to a different way of life (relatively immobile or parasitic) complex forms gave rise to simpler ones. New groups usually appeared from relatively simple, un-specialized forms. The development of some forms was al-ways accompanied by the extinction of others that were not as well adapted. Evolution as a whole is monophyletic, and like any development it is an irreversible process. In terms of the character of the organic world the Paleozoic era is clearly divided into two stages. Predominantly marine organisms are typical of the first stage (the Cambrian, Ordovician, and Silurian), which coincides with the Caledonian tectonic cycle. Various microorganisms and blue-green algae continue to exist; foraminifers (agglutinating), radiolarians, Archaeocyatha, sponges, bryozoans, coelenterates, mollusks, arthropods, and echinoderms appear. Especially typical are tabulate corals, tetracorals, Endoceratoidea, Actinoceratoidea, trilobites, brachiopods, cystoids, and graptolites. The first vertebrates appear in the Ordovician: fishlike Agnatha with a two-chambered heart and a simply arranged brain protected by a cranium, which appeared for the first time. The further development of marine vertebrates followed the path of increasing complexity of the brain (cephalization), circulatory system, and all other organs. At the end of the Silurian and beginning of the Devonian, when marine conditions were replaced by continental conditions (end of the Caledonian cycle) over a significant area of the earth, many representatives of these groups became extinct. At the same time, at the end of the Silurian, the first true fish, with jaws, appear. The second stage is the late Paleozoic. It coincides with the Hercynian tectonic cycle and is characterized by a further evolution of the organic world and by the appearance and extensive spread of terrestrial plants and animals. At the beginning of the Devonian the first land flora spread; these were the Psilophytineae, which included primitive lycopsids, arthrophytes, and Primofilices. At the beginning of the late Devonian these flora were replaced by archaeopteric flora (named after Archaeopteris, the typical plant). The first insects and land chelicerates (scorpions, spiders, and ticks) appear. The number of trilobites and graptolites in the seas decreases sharply, but a number of new groups, in particular ammonoids of the cephalopods, appear. The appearance and rapid development of fish (placoderms, actinopterygians, crossopterygians, and dipnoans) are especially typical of the Devonian, and for this reason the Devonian period is some-times called the age of fishes. A substantial advantage of the fish in comparison with the Agnatha was the presence of jaws and a more complex brain consisting of five compartments. At the end of the Devonian the first four-footed land animals arose from the crossopterygians; these were the labyrinthodonts, which were classified as amphibians. Just as with present forms, their reproduction was closely linked to the water in which the larvae developed and further metamorphosis took place. Gas exchange took place in primitive lungs and through moist skin. It is possible that the front compartment of the brain was divided into two hemispheres. The end of the Paleozoic (the Carboniferous and Permian periods) was the stage when different groups of organisms, first of all plants, conquered the land. Forest-type vegetation developed; in it sporophytes such as lycopsids, arthrophytes, and primitive gymnosperms (cordaiteans and seed ferns) predominated. In the middle and late Carboniferous three botanical-geographical provinces became differentiated: the tropical, with flora of the Euramerian and Katasian types, and two nontropical—the northern (Angara) and southern (Gondwana). In the tropical province woody lycopsids (lepidodendrons and sigillarias), arthrophytes (Calamities), and various seed ferns predominated; in Angara province, cordaiteans; and in Gondwana province, glossopterians. With the flourishing of vegetation many land invertebrates, first of all arthropods (insects), become numerous. Amphibians became very varied. In the Carboniferous the first reptiles (cotylosaurs) arose from them. Their bodies were covered with cornified skin (which prevented loss of moisture). It is probable that they, like the reptiles of today, reproduced on land; their eggs were protected by a calciferous shell and breathing was done entirely with lungs. The circulatory and nervous systems became more developed. In the middle of the Permian period, which coincided with the end of the Hercynian tectonic cycle, the dimensions of the seas decreased and the area of the continents increased substantially. True gymnosperms—conifers, ginkgoaceous plants, cycads, and Bennettitales—became much more common. The reptiles achieved great variety; numerous groups of them are typical only of the Permian period. At the end of the Permian there were significant changes in marine fauna. Animals that became extinct included tetracorals; tabulate corals; many groups of crinoids, sea urchins, brachiopods, and bryozoans; the last representatives of the trilobites; a number of Chondrichthyes (cartilaginous fishes) and ancient actinopterygians; as well as a number of crossopterygians and dipnoans, amphibians, and reptiles. A fundamental renewal of marine fauna typified the beginning of the Mesozoic era (the Triassic period), which was linked to the beginning of the Mesozoic tectonic cycle. New groups of foraminifers and hexacorals appeared, and radiolarians, gastropods, and bivalve and cephalopod mollusks became more varied. Groups of water reptiles appeared: turtles, crocodiles, ichthyosaurs, and sauropterygians; on land there appeared new groups of insects, the first dinosaurs, and primitive mammals (the triconodonts, which were represented by very small and rare forms). At the end of the Triassic flora formed in which ferns, cycads, Bennettitales, gingkoes, czekanowskiales, and conifers predominated. In the Jurassic period the development of the groups that had appeared in the Triassic generally continued. Among the marine invertebrates the ammonites and belemnites reached their zenith. Reptiles occupied a dominant position; ichthyosaurs, plesiosaurs, pliosaurs, turtles, and crocodiles inhabited the seas, while carnivorous and herbivorous dinosaurs lived on land, and pterosaurs inhabited the air. The ancient birds (Archaeopteryx) arose from the reptiles at the end of the Jurassic. Land flora was characterized by the development of ferns and gymnosperms; in the temperate Siberian region the most widespread and numerous were the ginkoes, czekanowskiales, and conifers; in the tropical (IndoEuropean) region the ferns, cycads, and Bennettitales were most common. During the Cretaceous period there was further change in the groups of animals and plants known in the Jurassic. Toothed birds (Odontornithes) appeared and dinosaurs reached gigantic sizes. In the middle of the Cretaceous period angiosperms replaced gymnosperms on land; the appearance and development of many groups of insects, birds, and mammals is related to the appearance of flowering plants. At the end of the Cretaceous period a number of groups became extinct or changed very greatly. The ammonites, almost all the belemnites, many groups of bivalves (rudistids and Inoceramidae) and gastropods, a number of groups of brachiopods, ganoid fish, many marine reptiles, and all the dinosaurs and pterosaurs became extinct. The beginning of the Cenozoic era was characterized by the appearance of new groups of foraminifers (the nummulites were especially typical), mollusks, bryozoans, and echinoderms. Bony fish spread throughout all fresh and marine bodies of water. The appearance of a number of groups of birds and mammals was especially important. Owing to further complexity in brain development, warmbloodedness, and live birth the mammals proved more capable of survival than the reptiles; they were less dependent on changes in the environment. Some of the mammals adapted to different conditions of life on land, while others adapted to life in the sea (the cetaceans and pinnipeds), and still others adapted to flight (bats). At the beginning of the Paleogene the monotremes, marsupials, and primitive placental mammals predominated. The so-called indricotheric fauna (named after the characteristic large hornless rhinoceros Indricotherium) that is known from Asia was typical of the end of the Paleogene. There was a clear distinction between the tropical and subtropical botanical-geographic regions, which had a predominance of evergreen dicotyledons, palms, and arborescent ferns, and the temperate region, which had coniferous and broadleaved forests. At the end of the Paleogene and especially at the beginning of the Neocene all types of previously known invertebrates continued to develop in the seas; their generic and species composition became closer and closer to that of the present. Bony fish predominated, amphibians and reptiles continued to develop, and the area of distribution of birds expanded. Australia’s isolation led to the preservation of marsupials and monotremes there. On the other continents placental mammals became dominant. At the beginning of the Neocene hipparion fauna became widely distributed; their composition included three-toed horses (Hipparion), rhinoceroses, mastodons, giraffes, deer, carnivores (saber-toothed tigers and hyenas), and various types of monkeys. On the territory of the USSR and Western Europe warm-temperate flora developed, while tundra vegetation formed in the northern regions, virtually all of Siberia was covered with taiga, and grassy plains appeared in Europe and North America. During the Anthropogenic period, the shortest in geological history, the formation of modern flora and fauna has continued. The plant and animal world of the northern hemisphere has changed greatly in connection with the major periods of glaciation. Certain unique forms (the mammoth and wooly rhinoceros) have appeared and become extinct. The appearance and development of man was the most important event of this period. The historical development of the organic world on earth is an exceptionally complex, multifaceted process all of whose elements are interrelated and depend on one another; its basis is growth in the diversity of the organic world and its adaptability to a variety of living conditions. According to recent finds the most ancient people evidently appeared about 2 million years ago (in the opinion of some scientists, 1 million years ago). The question of where human beings arose has not been finally resolved. Some scientists consider Africa to have been the original home, others feel it was the southern regions of Eurasia, and still others feel it was the Mediterranean region. Even in the Lower Paleolithic human beings had settled a considerable part of the land: vast regions in central and southern Europe and many regions in Africa and Asia. By the Upper Paleolithic man in his present physical type had taken shape (Homo sapiens, or “intelligent man”) and clan organization probably arose at the same time. In the Upper Paleolithic people settled even broader areas, including the vast regions of Europe and Asia that had been freed of their ice sheet. Reaching the northeastern frontiers of Asia, people also moved into North America. It was also in the Upper Paleolithic that people from southern Asia began to settle Australia and New Guinea. In the Mesolithic man continued his advance into land areas that were not yet settled. In Europe Scotland, Scandinavia, the eastern shores of the Baltic Sea, and part of the coast of the Arctic Ocean were occupied. The spread of people in America continued. In the Neolithic the remaining unsettled regions in the world, specifically the Japanese islands (some researchers believe that Japan was settled somewhat earlier) and many of the islands of Oceania, were settled. In the process of social production man has influenced the natural environment around him; it carries the mark of the labor of many human generations which lived under the conditions of the different socioeconomic formations that have followed one another. The degree and nature of the interaction between man and nature depend on the level of development of human society; they result above all from differences in the socioeconomic system. The forms of human influence on nature are varied. As a result of these influences water resources are redistributed, local climate changes, and some features of the relief are transformed. Human influence on living nature is especially significant both in its direct form and through influence on other natural components. Change in one of the components of the geographic landscape as the result of human activity leads to change in others. Natural conditions exert a fundamental, although not decisive, influence on the direction of economic activity and on many elements of culture (including housing, clothing, and food). The full aggregate of human influences on nature is more and more often called use of nature, which may have an irrational or rational character. Irrational use of nature may be the result of intentionally predatory human influences on nature or the result of spontaneous influences only mediated by humans, but in both cases it leads to impoverishment of and decrease in the quality of the environment. Rational use of nature includes all processes of intelligent (comprehensive and economical) development of natural resources, protection of nature, and purposeful transformation of nature. These processes manifest themselves differently in relation to the resources of the environment and to the expenditure of natural resources. Rational development of the resources of the environment involves optimal adaptation, preservation means maintaining favorable conditions, and transformation refers to improvement; the development of resources being expended means extracting and processing them in a comprehensive and economical manner, preservation means maintaining productivity (ensuring reproduction of the reproducible), and transformation means quantitative increase and qualitative improvement. With the development of productive forces man needs a greater variety of natural resources. At the same time the influence of human society on the natural environment grows steadily stronger. Human knowledge and development of natural resources are becoming much more complete and multifaceted. The modern scientifictechnical revolution leads, on the one hand, to more profound understanding and use of natural resources and, on the other, to revaluation of many of them. The effects of human influence on nature, especially in Europe and North America, have been greater in scope and variety in the last 100-200 years than they have been for millions of years in the past. And now, with the rapid growth in population in many countries and especially with the sharp intensification of human activity related to the scientific-technical revolution, the rate of use of natural resources is growing swiftly; this refers to both irreplaceable (for example, minerals) and replaceable (for example, soil, plants, and animals) resources. Therefore, humanity faces a most serious problem: preventing the danger of ruining the environment that it inhabits and of undermining nature’s productivity all the way down to complete desolation. In all the presocialist socioeconomic systems the use of natural resources was for the most part irrational and preda-tory. In the last few centuries the area of forests on earth has decreased 1.75 times (estimated); today (1970) the forest area comprises 4.1 billion hectares. In the past century erosion and deflation have put about 2 billion hectares, which is 27 percent of agricultural land, out of use. Many species of valuable animals and plants have disappeared. Irrational methods of developing minerals are leading to irreversible losses of enormous amounts of scarce mineral raw materials. In the present age protection of the landscape shell from ever-increasing pollution during the rapid process of urbanization and industrialization is acquiring paramount importance; the primary centers of environmental pollution are the cities. The sources of pollution of the hydrosphere, in particular, are domestic and industrial waste (for example, 1 cu m of untreated sewage makes 50-60 cu m of river water unsuitable). The discharge of enormous amounts of dust, sulfur dioxide, carbon monoxide, ash, cinders, metal compounds, and waste waters by factories, plants, electric power stations, and motor vehicles and the introduction of excess amounts of toxic chemicals into the soil have a harmful effect on flora and fauna and create a threat to human health. Radioactive contamination of the landscape shell is especially dangerous. Apprehensions are also arising concerning possible overheating of the atmosphere in the future as a result of both direct discharge of heat and reduction in the outflow of heat because of the accumulation of CO2 in the atmosphere. The task of protecting nature and using natural resources rationally is becoming an important state and international problem; it has been the subject of international conferences called by the United Nations and by UNESCO. Scientific forecasting of the availability of natural resources and working out general norms for the protection of nature are exceptionally important for long-term preservation of the balance among the vitally important elements of nature. In the USSR questions of protecting and restoring nature are considered to be an important national economic task; in the Union republics special laws have been adopted on the protection of nature. The Communist Party of the Soviet Union and the Soviet state are making provisions for working out the scientific principles of protecting and transforming nature in order to improve the natural environment surrounding man and to make better use of natural resources. In the United States and other developed capitalist countries significant steps are being carried out to protect nature, but under conditions of the capitalist economy their implementation often meets with resistance by various monopolistic groups who are concerned for their own interests. Among the most urgent problems of modern man is the population problem, above all the accelerated rate of population growth. Thus, at the beginning of our era there were about 200 million people; in the year 1000, 275 million; in the middle of the 17th century, 500 million; in 1850, 1.3 billion; in 1900, 1.6 billion; in 1950, 2.5 billion; and in 1970, 3.6 billion. In just the last 70 years of the 20th century the world population has increased 2.2 times; population growth is particularly rapid in the developing countries of Asia, Africa, and Latin America. In order for the standard of living of people to increase along with an increase in population, however, it is necessary to combine population growth with economic and cultural progress, which is above all and most closely intertwined with the nature of the socioeconomic order. Successful accomplishment of this most important task is only possible under conditions of a socialist order. The ever-growing population of the globe places before many countries, especially the developing countries, the problem of supplying food to the people. Fifty percent of the world population receives a diet that is below the norm in terms of calories. Each year 2 million people in the capitalist world die of hunger. There must be a significant increase in the cultivated land area to increase the supply of food to the population. According to UN figures, at the beginning of 1968 of the 15 billion hectares of land only 1.4 billion hectares was cropland, orchards, and plantations; but there is about 6.5 billion hectares of land suitable for cultivation (on the condition that land improvement and other organizational work is done). Raising the yield of agricultural crops and increasing the productivity of animal husbandry hold much promise for increasing the supply of food. The food resources of the seas and oceans may also serve as a major source of food. The problem of providing humanity with water is very important. Serious problems related to a shortage of water, especially fresh water, are already arising today in a number of countries. It is especially important to transform the water balance in order to eliminate water shortage in some regions and surpluses in others. The earth is quite abundantly provided with raw material reserves for various industrial sectors; there is reason to sup-pose that when certain types of resources are exhausted possibilities will be found to replace them with other types. According to the rough estimate of the Soviet scientist N. V. Mel’nikov, humanity is provided with enough classical types of fuel (coal, petroleum, natural gas, peat, and combustible shales) for 300-320 years at the 1980 level of consumption and for 140-150 years at the consumption level of the year 2000. At the same time, atomic energy will take a more prominent place in the world’s fuel-energy system. An enormous amount of energy could be obtained if the difficult problem of controlling thermonuclear synthesis were resolved. Large stores of ore and nonmetallic minerals have also been discovered in the earth’s interior. Energy and mineral resources (petroleum and gas; coal; sulfur; ironmanganese and phosphorite concretions; ores of ferrous, nonferrous, and rare metals; placer deposits of tin, gold, diamonds, and other minerals) are very great not only on land but also on and underneath the floor of the oceans and seas. The production of artificial and synthetic materials to replace natural minerals is developing rapidly. Nonetheless, despite the abundance of minerals, they should be developed very rationally, comprehensively, and economically because they are exhaustible. Socialist society has the most optimal conditions for solving the problems of rational use of the geographic environment and the problems of population; it has become possible to achieve the most rational geographic division of labor based on the natural and economic characteristics of different regions and countries while extensively developing the principles of socialist economic integration and to increase substantially the material goods created by human beings. Razvitie nauk o Zemle v SSSR. Moscow, 1967. Kalesnik, S. V. Obshchie geograficheskie zakonomernosti Zemli. Moscow, 1970. Markov, K. K., O. P. Dobrodeev, lu. G. Simonov, and I. A. Suetova. Vvedenie vfizicheskuiu geografiiu. Moscow, 1970. Markov, K. K. Paleogeografiia, 2nd ed. Moscow, 1960. Kulikov, K. A., and N. S. Sidorenko. Planeta Zemlia. Moscow, 1972. Bakulin, P. I., E. V. Kononovich, and V. I. Moroz. Kurs obshchei astronomii, 2nd ed. Moscow, 1970. Zharkov, V. N., V. P. Trubitsyn, and L. V. Samsonenko. Figury Zemli i planet: Figury i vnutrennee stroenie. Moscow, 1971. Ivanov-Kholodnyi, G. S., and G. M. Nikol’skii. Solntse i ionosfera, Moscow, 1969. Vliianie solnechnoi aktivnosti na atmosferu i biosferu Zemli: Sb. st. Moscow, 1971. Kulikovskii, P. G. Spravochnik liubitelia astronomii, 4th ed. Moscow, 1971. Khrgian, A. Kh. Fizika atmosfery, 2nd ed. Moscow, 1958. Khvostikov, I. A. Vysokie slot atmosfery. Leningrad, 1964. Budyko, M. I. Teplovoi balans zemnoi poverkhnosti. Leningrad, 1956. Budyko, M. I. Klimat i zhizn. Leningrad, 1971. Atlas teplovogo balansa zemnogo shara. Edited by M. I. Budyko.Moscow, 1963. Khromov, S. P. Meteorologiia i klimatologiia dlia geograficheskikh fakul’tetov, 2nd ed. Leningrad, 1968. Pogosian, Kh. P., and Z. L. Turketti. Atmosfera Zemli. Moscow, 1970. Rubinshtein, E. S., and L. G. Polozova. Sovremennoe izmenenie klimata. Leningrad, 1966. Minina, L. S. Iskusstvennye sputniki Zemli na sluzhbe u meteorologov. Moscow, 1970. Kalinin, G. P. Problemy global’noi gidrologii. Moscow, 1968. Egorov, N. I. Fizicheskaia okeanografiia. Leningrad, 1966. Alekin, O. A. Khimicheskii analiz vod sushi. Leningrad, 1954. Alekin, O. A. Khimiia okeana. Leningrad, 1966. Frolov, lu. S. “Novye fundamental’nye dannye po morfometrii Mirovogo okeana.”Vestnik LGU, 1971, no. 6. Magnitskii, V. A. Vnutrennee stroenie ifizika Zemli. [Moscow] 1965. Vinogradov, A. P. “Khimiia Zemli.” In the collection Glazami uc he no go. Moscow, 1963. Liustikh, E. N. “Zagadki glubokikh nedr Zemli.”Priroda, 1967, no. 12. Liubimova, E. A. Termika Zemli i Luny. Moscow, 1968. Zharkov, V. N. “Viazkosf nedr Zemli.”Tr. in-tafiziki Zemli im. O. lu. Shmidta, 1960, no. 11 (178). Artiushkov, E. V. “Differentsiatsiia po plotnosti veshchestva Zemli i sviazannye s nei iavleniia.”Izv. AN SSSR: Fizika Zemli, 1970, no. 5. Maeva, S. V. “Teplovaia istoriia Zemli s zheleznym iadrom.”Izv. AN SSSR: Fizika Zemli, 1971, no. 1. 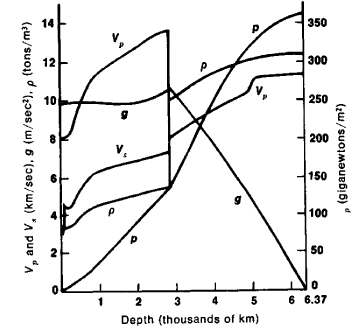 Birch, F. “Density and Composition of Mantle and Core.”Journal of Geophysical Research, 1964, vol. 69, no. 20. Haddon, R. A. W., and K. E. Bullen. “An Earth Model Incorporating Free Earth Oscillation Data.”Physics of the Earth and Planetary Interiors, April 1969, vol. 2, no. 1. The Earth’s Crust and Upper Mantle. Edited by P. J. Hart. Washington, 1969. Strakhov, N. M. Osnovy istoricheskoi geologii, part 1. Moscow-Leningrad, 1948. Belousov, V. V. Osnovnye voprosy geotektoniki, 2nd ed. Moscow, 1962. Khain, V. E. Obshchaia geotektonika. Moscow, 1964. Khain, V. E. Regional’naia geotektonika: Severnaia i luzhnaia Amerika, Antarktida i Afrika. Moscow, 1971. Tugarinov, A. I., and G. V. Voitkevich. Dokembriiskaia geokhronologiia materikov, 2nd ed. Moscow, 1970. Meshcheriakov, lu. A. Strukturnaia geomorfologiia ravninnykh stran. Moscow, 1965. Leont’ev, O, K. Dno okeana. Moscow, 1968. Leont’ev, O. K. “Tipy planetarnykh morfostruktur Zemli i nekotorye cherty iz dinamiki v kainozoe.”Geomorfologiia, 1971, no. 3. Problemy planetarnoi geografii (Collection of articles). Moscow, 1969. Efremov, lu. K. “Landshaftnaia sfera nashei planety.”Priroda, 1966, no. 8. Lukashova, E. N. “Osnovnye zakonomernosti prirodnoi zonal’nosti i ee proiavlenie na sushe Zemli.”Vestnik MGU: Ser. geograficheskaia, 1966, no. 6. Ermolaev, M. M. “Geograficheskoe prostranstvo i ego budushchee.”Izv. Vses. geograficheskogo ob-va, 1967, vol. 99, no. 2. Ermolaev, M. M. “O granitsakh i strukture geograficheskogo prostranstva.”Izv. Vses. geograficheskogo ob-va, 1969, vol. 101, no. 5. MiFkov, F. N. Landshaftnaia sfera Zemli. Moscow, 1970. Grigor’ev, A. A. Tipy geograficheskoi sredy. Moscow, 1970. Isachenko, A. G. Osnovy landshaftovedeniia i fiziko-geograficheskoe raionirovanie. Moscow, 1965. Zabelin, I. M. Teoriia fizicheskoi geografii. Moscow, 1959. Oparin, A. I. Zhizn’, ee priroda, proiskhozhdenie i razvitie, 2nd ed. Moscow, 1968. Orlov, lu. A. V mire drevnikh zhivotnykh, 2nd ed. Moscow, 1968. Nestrukh, M. F. Proiskhozhdenie cheloveka. Moscow, 1958. Drushchits, V. V., and O. P. Obrucheva. Paleontologiia. Moscow, 1971. Vernadskii, V. l.Izbr. soch. , vol. 5[Biosfera-Stat’i]. Moscow, 1960. Vernadskii, V. I. Biosfera. Moscow, 1967. Khil’mi, G. F. Osnovy fiziki biosfery. Leningrad, 1966. Biosfera i ee resursy: Sb. st. Moscow, 1971. Resursy biosfery na territorii SSSR. Moscow, 1971. L’vovich, M. I. Che lovek i vody. Moscow, 1963. L’vovich, M. I. Vodnye resursy budushchego. Moscow, 1969. Rodin, L. E., and N. I. Bazilevich. Dinamika organicheskogo veshchestva i biologicheskii krugovorot zol’nykh elementov i azota v osnovnykh tipakh rastitel’nosti zemnogo shara. Moscow-Leningrad, 1965. Riabchikov, A. M. “Gidrotermicheskie usloviia i produktivnost’ fitomassy v osnovnykh landshaftnykh zonakh.”Vestnik MGU: Ser. geograficheskaia, 1968, no. 5. Mel’nikov, N. V. Mineral’noe toplivo: Tekhniko-ekonomicheskii ocherk razvitiia toplivnoi promyshlennosti SSSR i ispoi’zovaniia topliva, 2nd ed. Moscow, 1971. Armand, D. Nam i vnukam, 2nd ed. Moscow, 1966. Bogorov, V. G. “Produktivnye raiony okeana.”Priroda, 1967, no. 10. Chislennost’ i rasselenie narodov mira. Edited by S. I. Bruk. Moscow, 1962. Kozlov, V.I . Dinamika chislennosti narodov. Moscow, 1969. Pokshishevskii, V. V. Geografiia naseleniia SSSR. Moscow, 1971. Pokshishevskii, V. V. Geografiia naseleniia zarubezhnykh stran. Moscow, 1971. What does it mean when you dream about the Earth? The third planet in the solar system, lying between Venus and Mars; sometimes capitalized. Solid component of the globe, distinct from air and water. Soil; loose material composed of disintegrated solid matter. 1. British term for ground, 3.